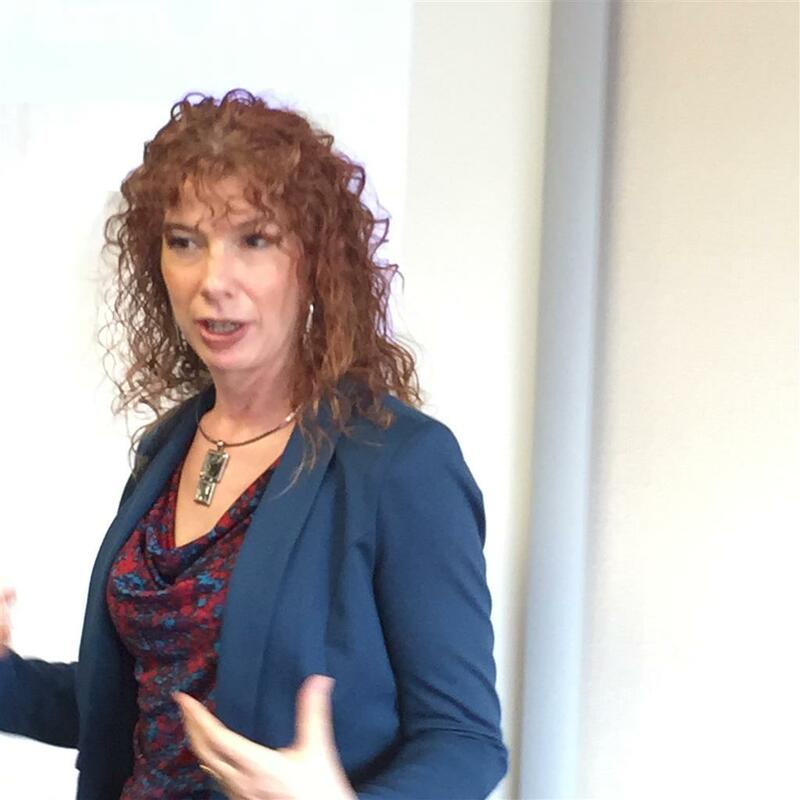 A most interesting presentation at today's meeting by Michelle Veran, Executive Director of Sidekicks Mentorship. A St. Albert based and developed program, Sidekicks Mentoring matches community volunteers to school-aged children between the ages of 6 to 16 with the goal of providing these children with positive mentors and role models to be their friends. Sidekicks is a program of the St. Albert Community Information Centre and a great example of doing good in the world. Thanks for sharing this information with us, Michelle. 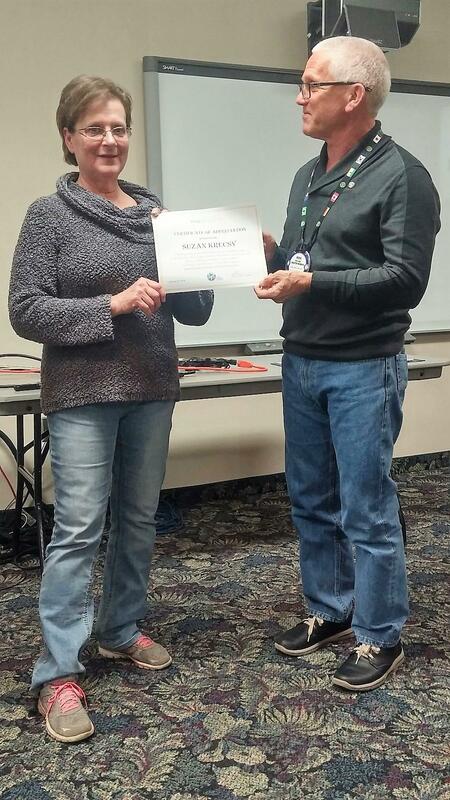 Shown presenting a certificate of appreciation to Michelle is club president Nonie Buski (on the left). - 8,879 junior and senior high school students were reached through the ACWS Leading Change Call to Action program. Many thanks for speaking to us, Jan, and for this very important work you do! 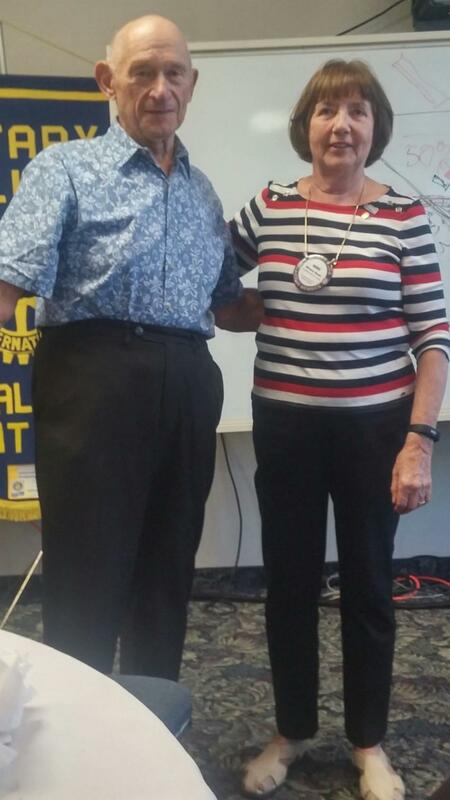 Shown in the photo thanking Jan is Nick Algar, one of our club directors. We were delighted to have Ray Pinco back with us this week to continue relating some of St. Albert's history. 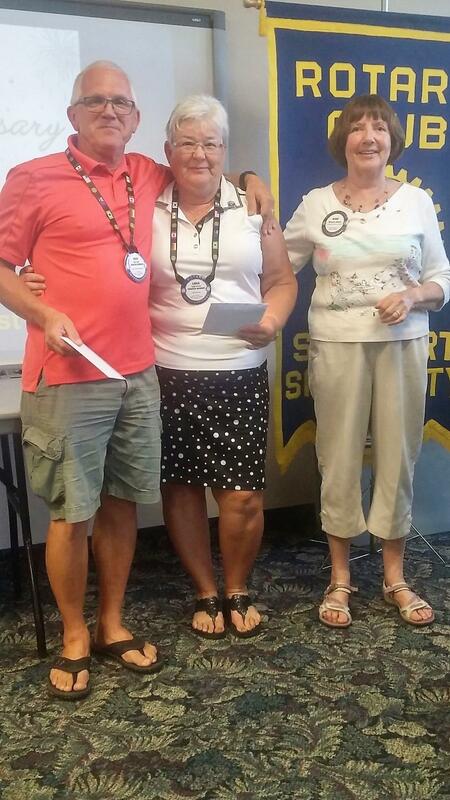 Shown thanking Ray is Club Administration Co-Director Lydia Hodgson. Keep learning....stay connected. 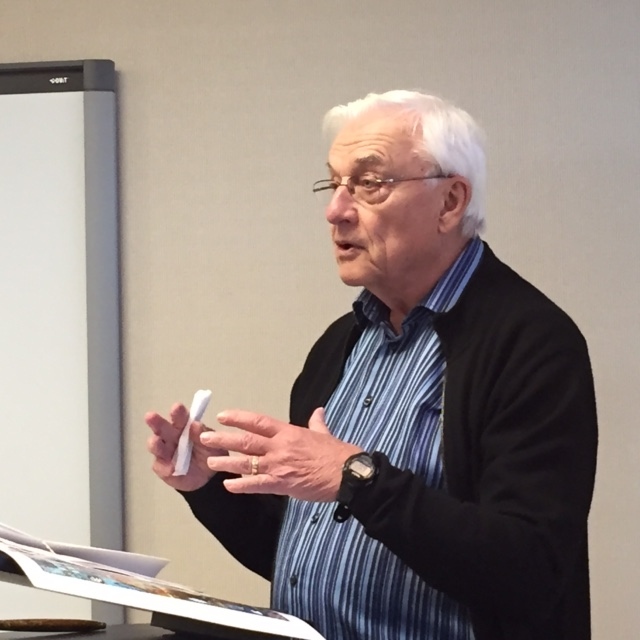 That was the message David Winfield brought to us at our meeting this week, when he spoke about ELLA (Edmonton Lifelong Learners Association). ELLA is once again offering a variety of courses during the 2019 Spring Session - April 29 to May 17. You can find out more at www.m-ella.com. Thank you for a most interesting presentation, David. Shown thanking David (on the right) is PDG Julius Buski. District 5370 Youth Programs in Great Shape! 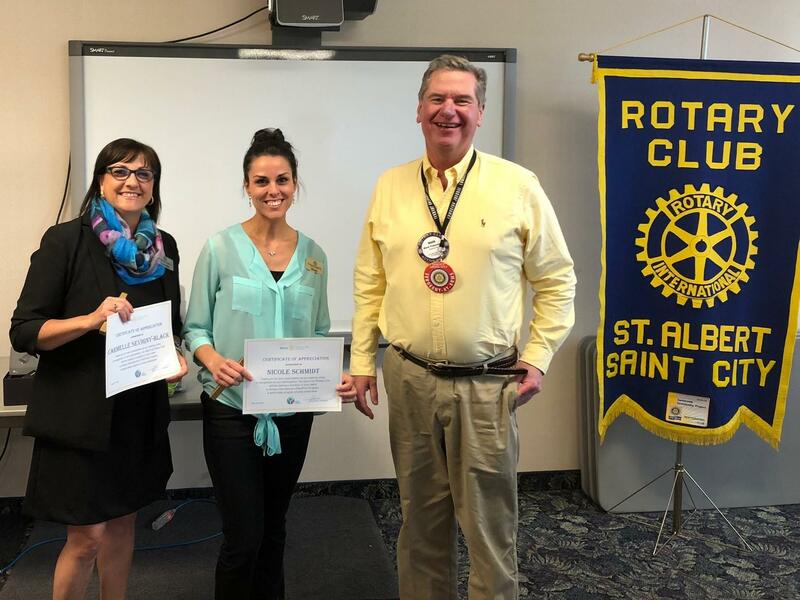 We were delighted to have District 5370 Youth Services Chair (and the District's Rotarian of the Year for 2017-18), Tamara Larson, speak to us about the District's Youth Programs at today's meeting.. There are presently 52+ Interact clubs and 9 Rotaract clubs in our district, which surpasses in total the 57 Rotary clubs! 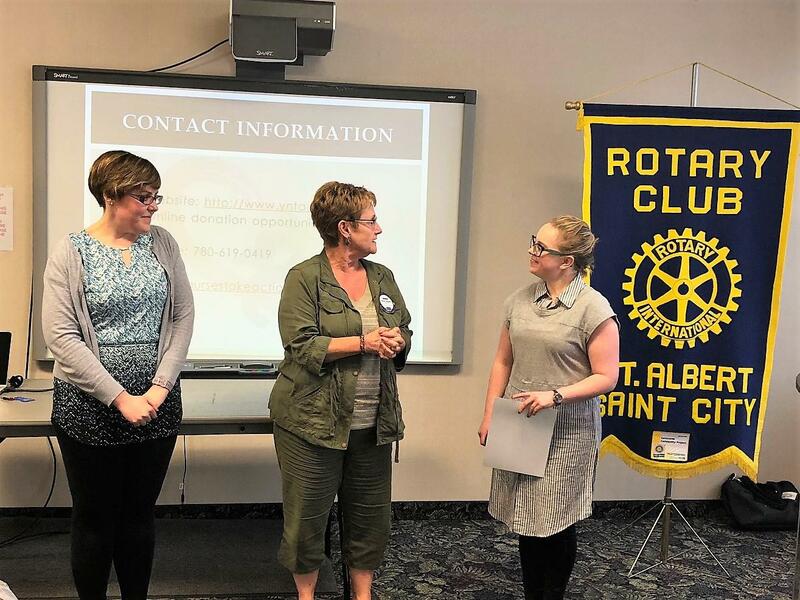 Tamara provided us with an interesting update on RYLA, RYLE and RYPEN, as well as an exciting collaboration with the Canadian Museum of Human Rights in Winnipeg. Thank you for sharing this with us, Tamara. 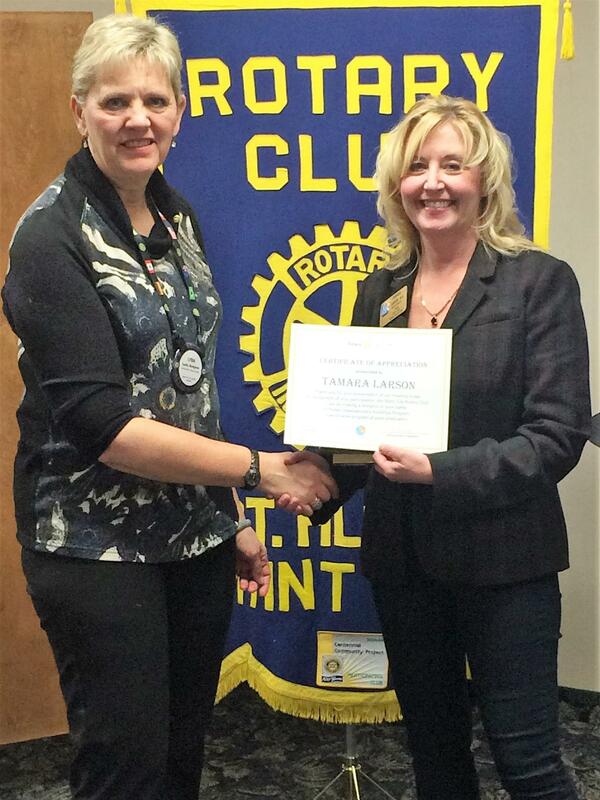 In recognition of Tamara's participation, the Saint City Rotary Club will be making a donation to Rotary's PolioPlus program in her name. 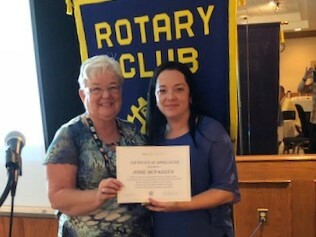 Shown presenting the thank you certificate to Tamara is Lydia Hodgson (left), the club's co-director of Club Administration. (Special thanks to Jeff Hodgson for serving as our official photographer for this and many other photos in our posts). 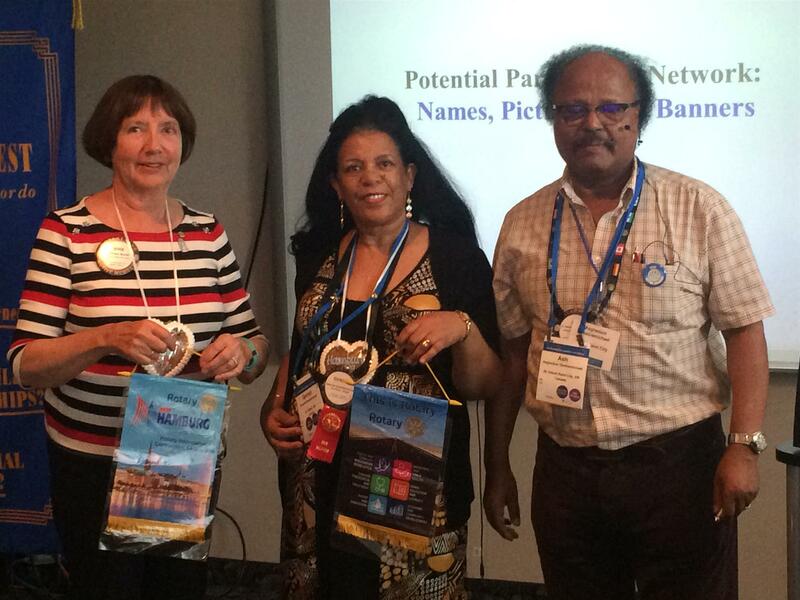 Saint City Rotary Club proudly supports DG Ingrid Neitsch's Rotary District Peacebuilder Initiative. At this evening's DG's visit, club president Nonie Buski presented Ingrid with the club's contribution of $675 towards this vital program. Shown thanking Doris is Saint City's Director of Administration, Lydia Hodgson. Project Amigo is celebrating 33 years of transforming lives through education in Colima, Mexico. 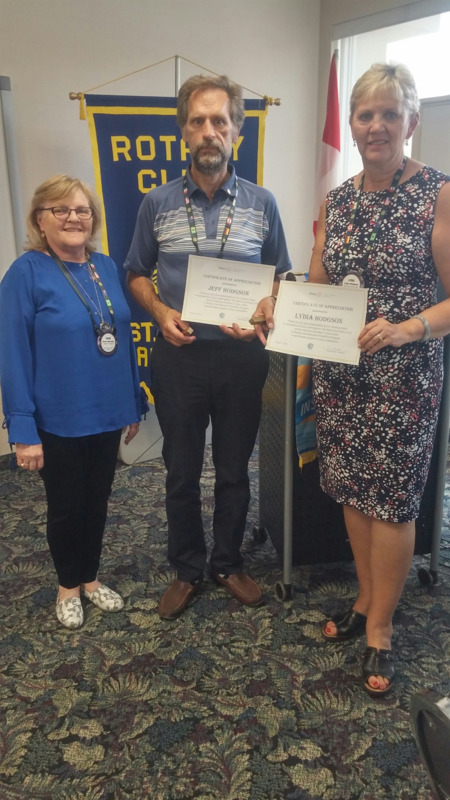 The project provides education funding for children as well as an on site hands-on opportunity for Rotarians to spend a week assisting the project in various ways. Saint City is proud to be sponsoring a child's education. We were delighted to have Edith Martin visit our club today and share some of the Project Amigo stories. Shown thanking Edith is club member Gennet Ghebremichael (on the left). 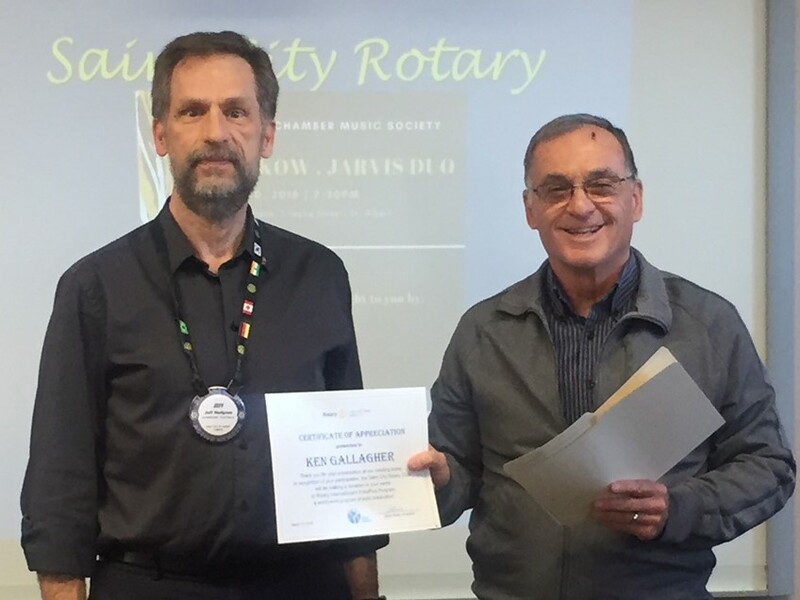 We were delighted to have Dr. Alan Murdock, President of the St. Albert Rotary Music Festival, visit us today and present Saint City president Nonie Buski with a certificate of appreciation for our support of the St. Albert Rotary Music Festival as a Scholarship and Award Donor. 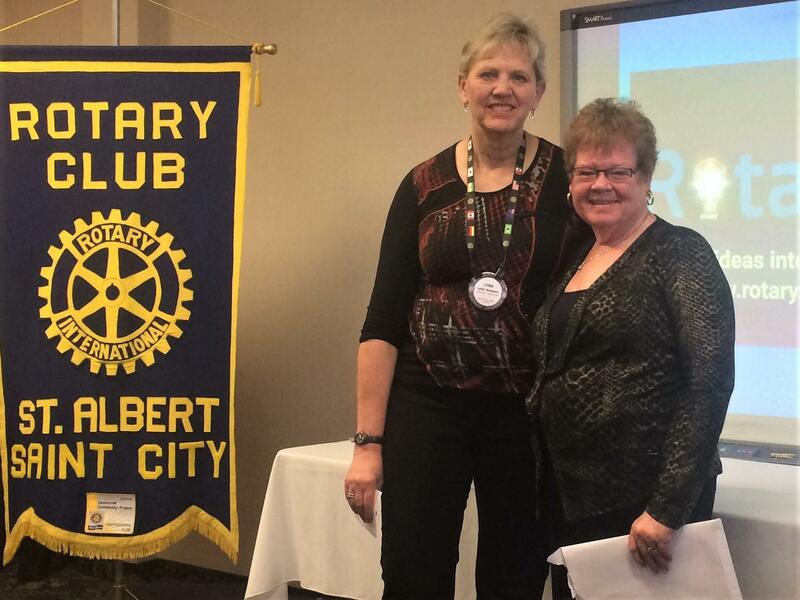 An outstanding presentation at today's meeting by Elaine Alton, member of the St. Albert Salvation Army church. Elaine shared with us the history of the Salvation Army and the many community-based programs offered by the church in St. Albert. An inspiring speaker! Thanks for sharing this story with us Elaine! 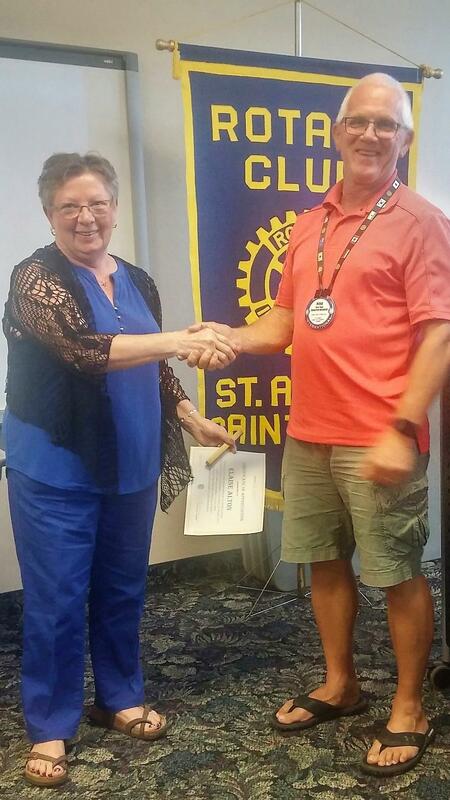 Shown thanking Elaine is Ross Algar, Saint City Rotary's Community Services director and a past president of the club. 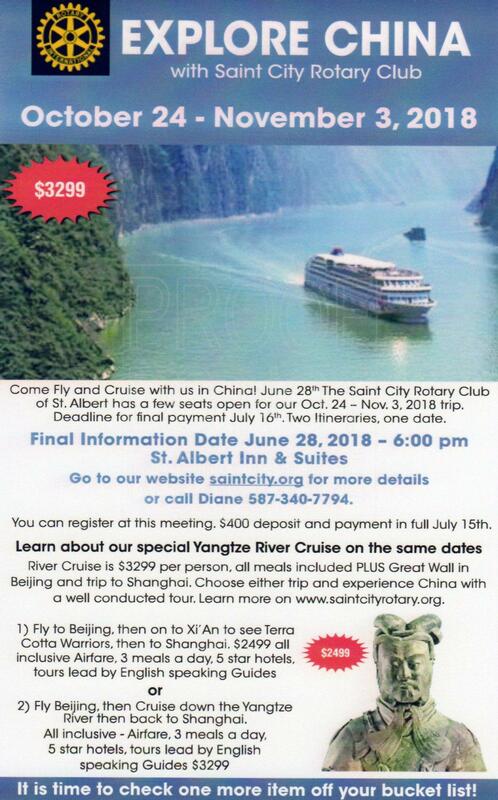 One of Saint City Rotary's fundraisers this past Rotary year was a trip to China. Jeff and Lydia Hodgson, two of our club members who went on the 11 day trip shared their experience at our meeting tonight. In addition to dozens of fascinating photos, our two travelers brought along some Chinese food for us to sample (locally sourced, of course!). Shown in the photo with Jeff and Lydia is Diane Mineault (on the left), our trip coordinator. Our next trip is a nine day excursion to Thailand and Hong Kong, departing February 14. Total all inclusive cost is $3,099. 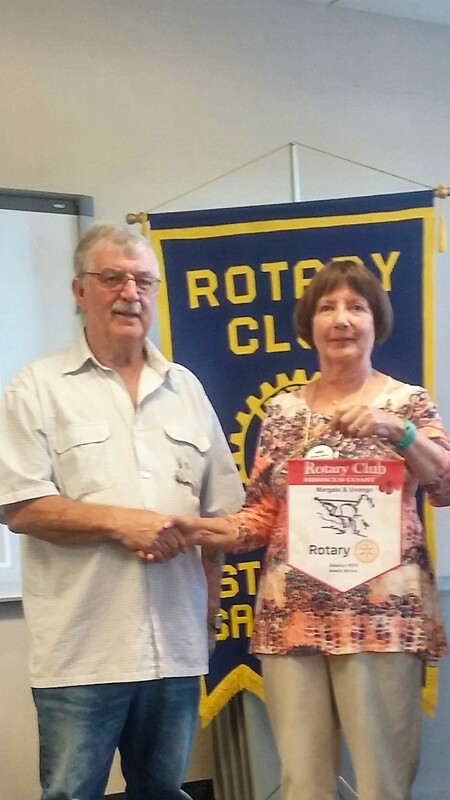 We were delighted to have Brian Blumrick, President of the Rotary Club of Hibiscus Coast, RD9370, visit us today. Shown exchanging banners with Brian is Saint City Club President Nonie Buski. 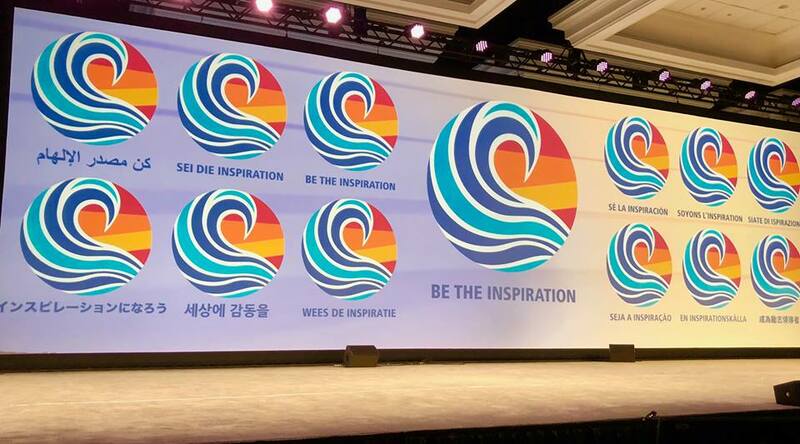 Rotary International's Convention is a great experience and the recent one in Toronto was no exception. Two of our club members, Dr. Ashgedom Ghebremichael and wife Gennet attended this one and reported on some of the highlights at our club meeting this week. 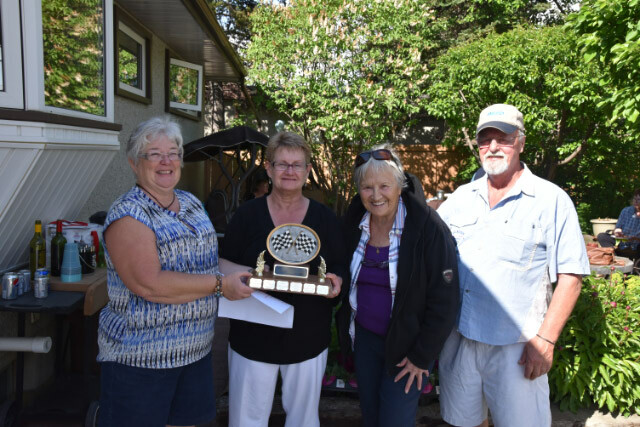 Shown in the photo with Ash and Gennet is club president Nonie Buski. 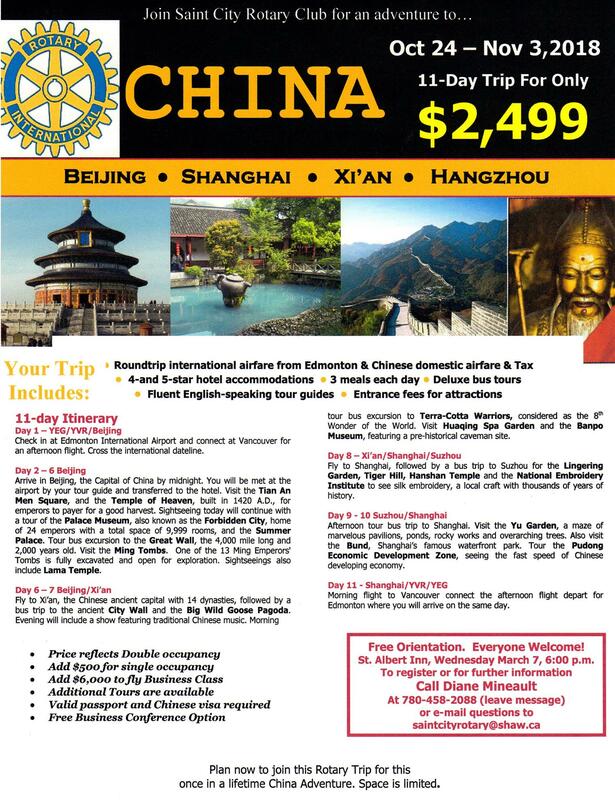 Last Chance to Sign up for this China Trip! We were fortunate at today's meeting to hear from Veronica Kong Executive Director) and Jackie Wiebe (Administrator) of CAMTA (Canadian Association of Medical Teams Abroad). CAMTA has just completed its 17th mission to Ecuador, providing free orthopedic care to the needy. Over 90 individuals took part, at their own expense or through raised donations! Saint City Rotary is proud to be a sponsor of this life-giving undertaking. 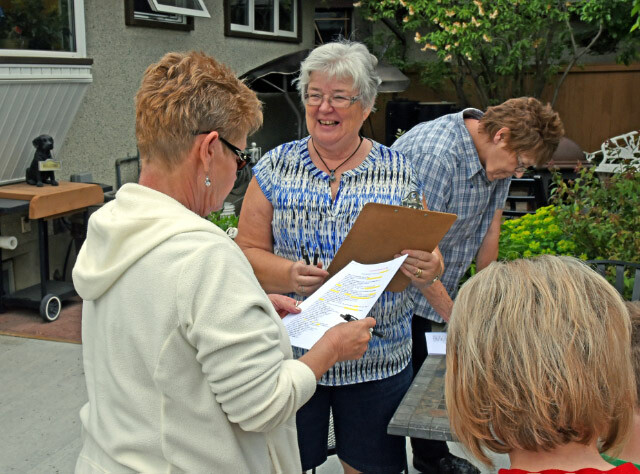 Shown in the photo (left to right) are Linda Perras (Saint City Secretary), Veronica Kong and Jackie Wiebe. There is help available for those experiencing spousal, family or elder abuse. 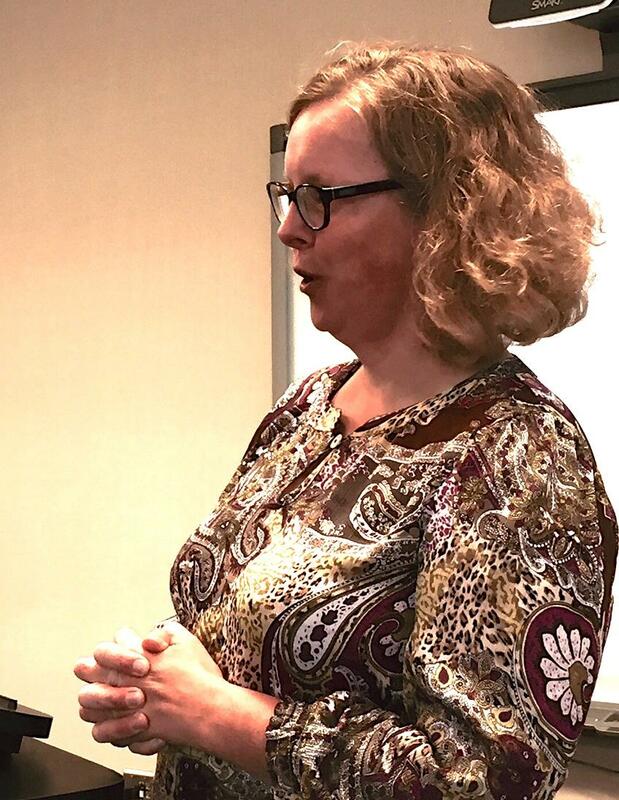 SAIF (Stop Abuse in Families) Executive Director Caroline Smigielski joined us for our meeting today and outlined the many excellent helpful programs available through SAIF. Shown thanking Caroline is Saint City's Community Services Director Ross Algar. How good is your hearing? Carmelle Sevigny-Black and Nicole Schmidt, from Discover Hearing in St. Albert, presented a very informative session at our meeting. They spoke on the topic of hearing, hearing loss and the amazing technological advancements in that field. Thanks for sharing with us Carmelle and Nicole! Shown in the photo with Carmelle and Nicole is our sergeant-at-arms, Mark Palynchuk. Saint City Rotary is proud sponsor of several youth leadership programs, including RYLE - Rotary Youth Leadership Experience. At our meeting this evening, we heard from two of our recent RYLE participants, Jillian Callbeck and Alex Black. 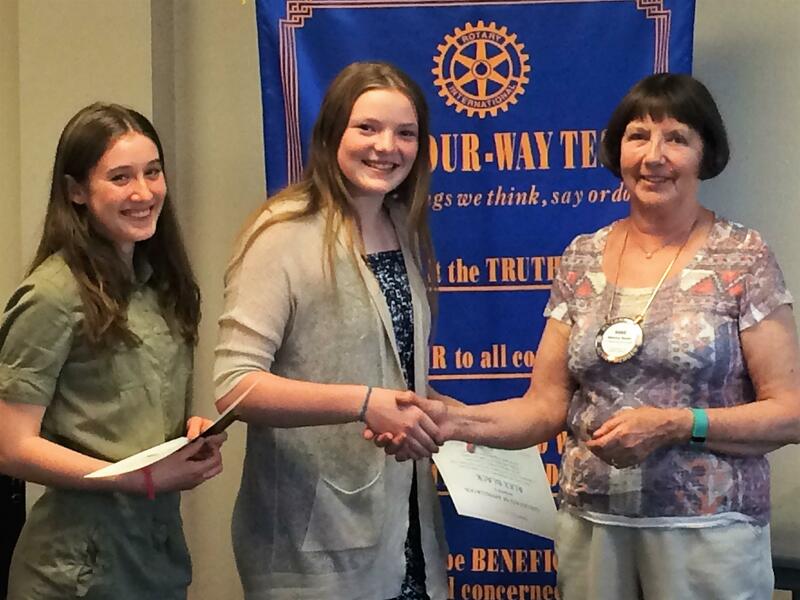 Shown thanking Jillian and Alex is incoming club president Nonie Buski. 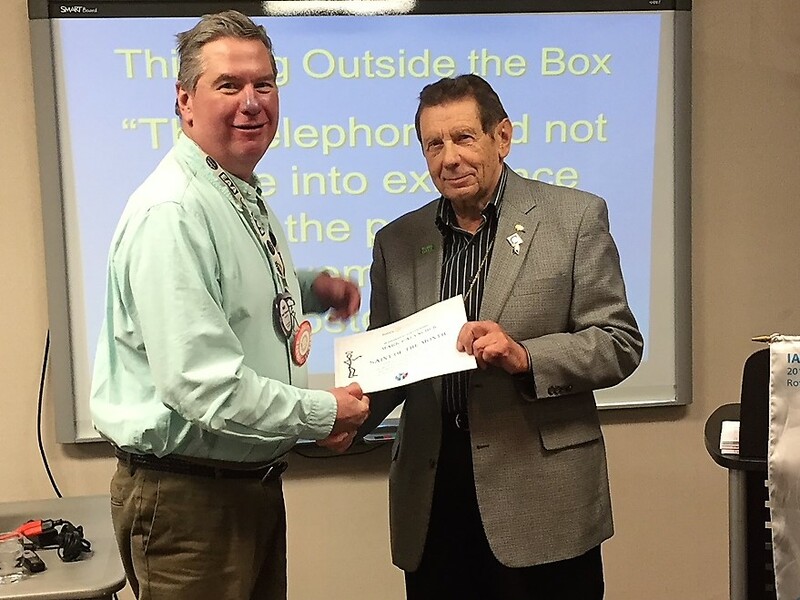 Saint City Rotary is proud to acknowledge the contributions to the club of Gerry Mazer, our Saint of the Month for May. 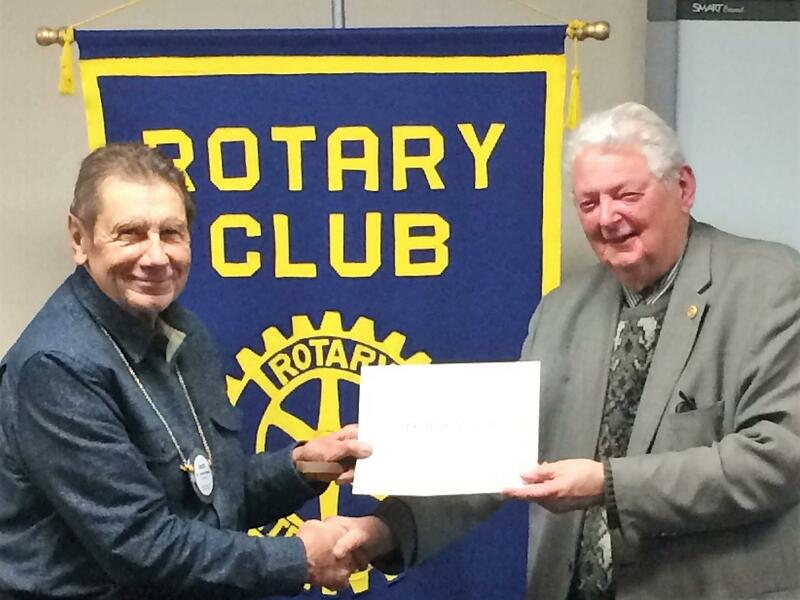 Gerry has held many leadership positions in Saint City Rotary, including past service as a president. He is currently our Membership Chair. 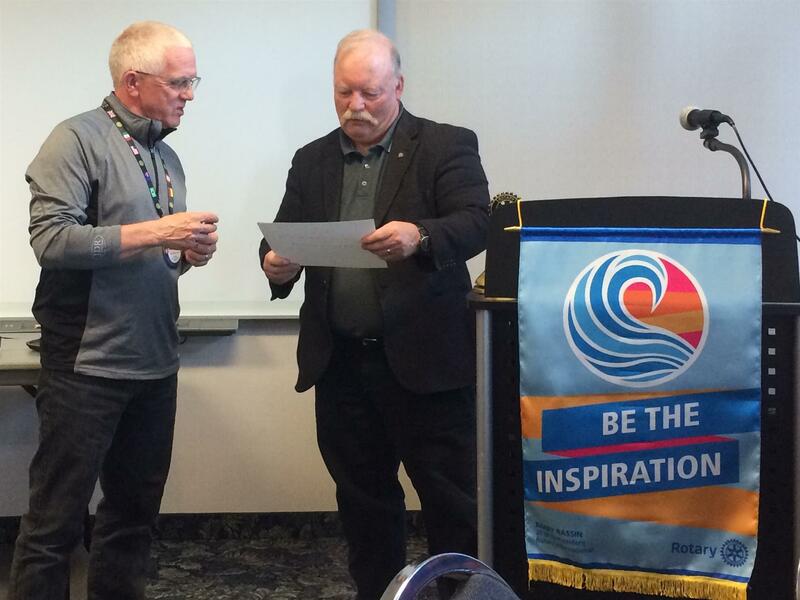 Thank you for all your contributions to our club and to Rotary, Gerry! 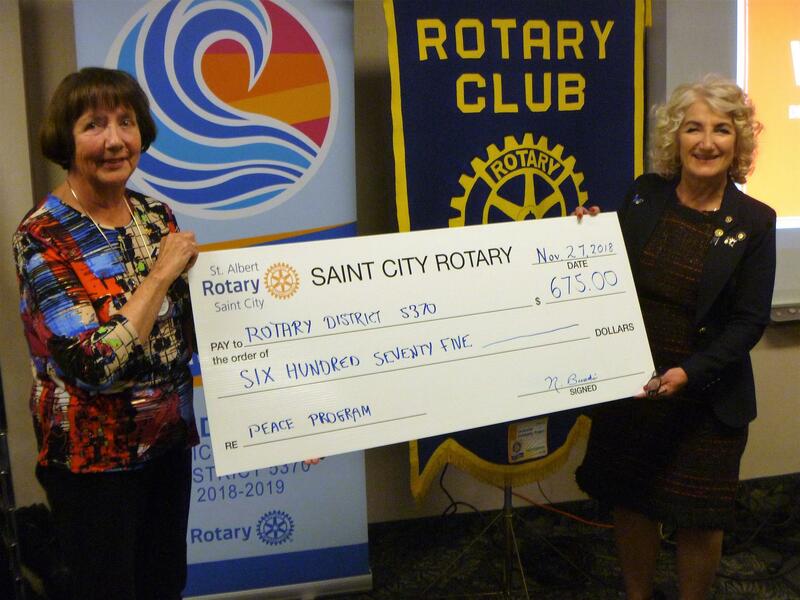 Shown in the photo are Saint City Club Administration Co-Director Lydia Hodgson, and Lori Kary. 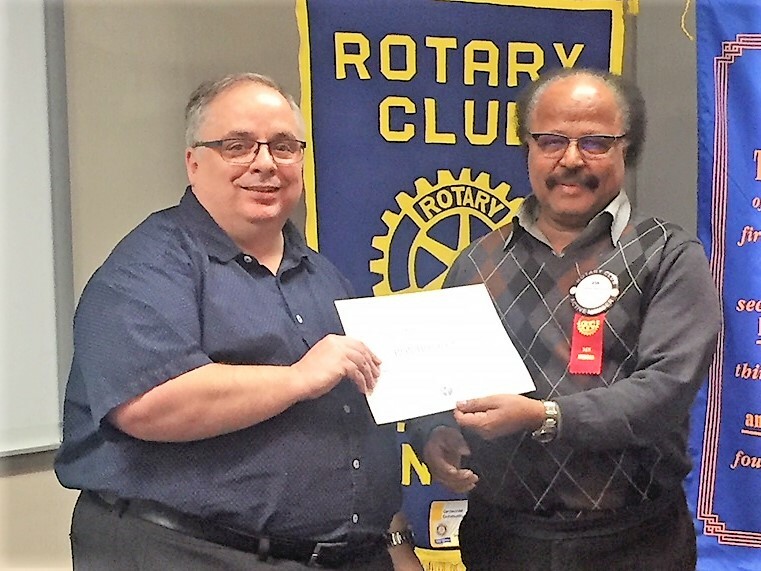 The Rotary Employment Partnership is a wonderful program, under the auspices of Inclusion Alberta, which matches developmentally challenged adults with potential employers. 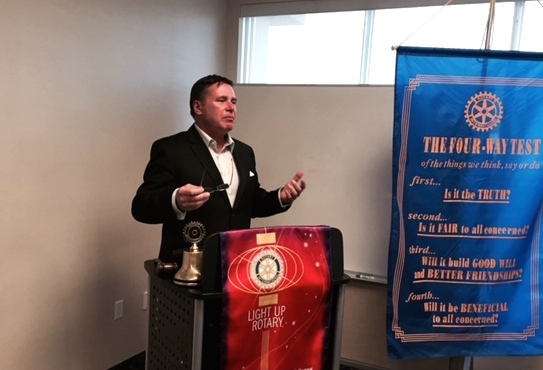 Bruce Uditsky, CEO of Inclusion Alberta, told Saint City Rotary Club about the opportunities the program provides for these individuals to find a meaningful and productive role in society. Thank you Bruce, and Inclusion Alberta, for the great work you do! 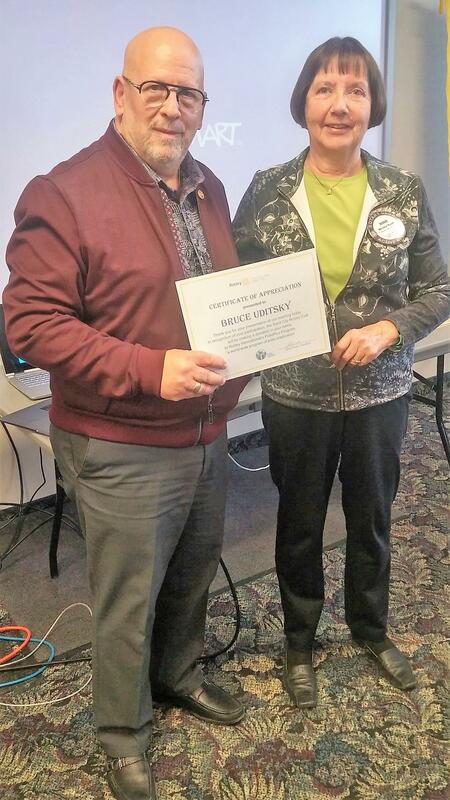 Shown thanking Bruce is Saint City Rotary president-elect Nonie Buski. Young Nurses Take Action - Volunteers Par Excellence! Maggy Danko and Kristin Jennings from YNTA (Young Nurses Take Action) spoke to us this evening about their group's genesis and the programs currently underway. Their medical missions have touched many lives in South America and this year's plans call for volunteer missions to Panama and Peruvian Amazon. A very inspiring presentation. 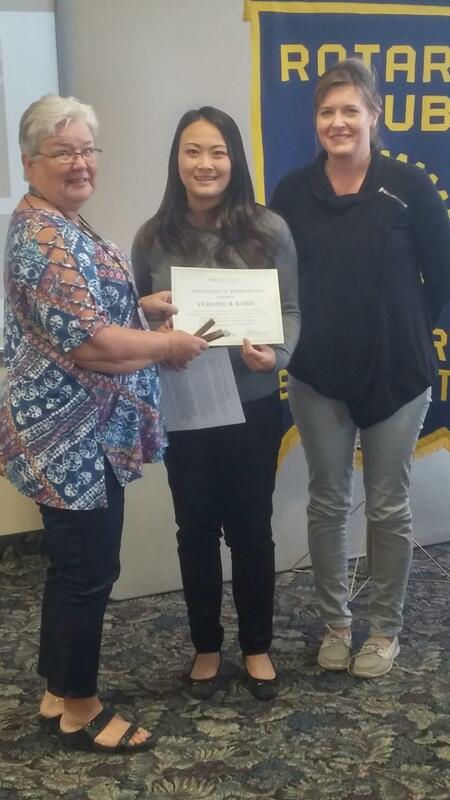 Shown in the photo are (left to right) Kristin Jennings, Saint City Treasurer Bonnie Huckabay presenting a thank you certificate, and Maggie Danko. 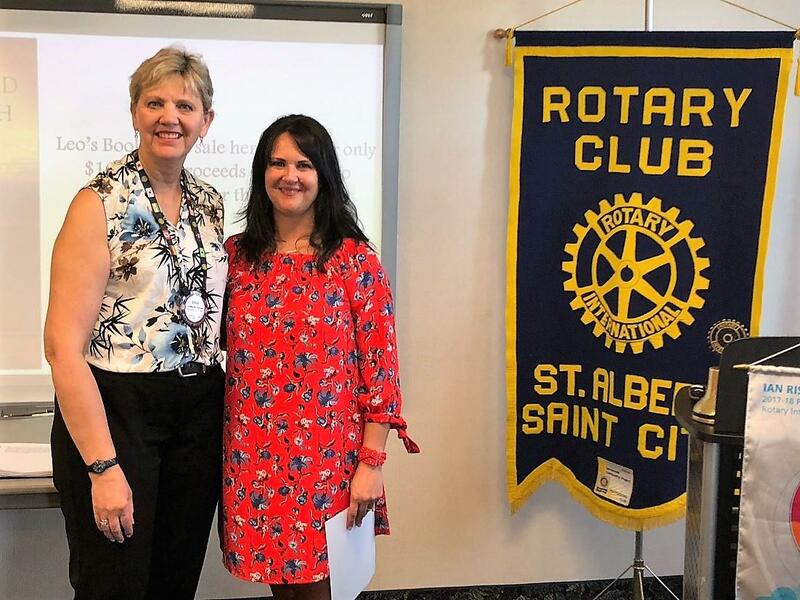 "It Starts With Me - St. Albert As a Welcoming and Inclusive Community" was the topic of Leanne MacMillan's presentation at Saint City Rotary's meeting tonight. Leanne, who is the Community Development Coordinator with the City of St. Albert, reminded us that there are long term impacts when people are excluded from participating in the community, be it as a result of social, societal or economic pressures. 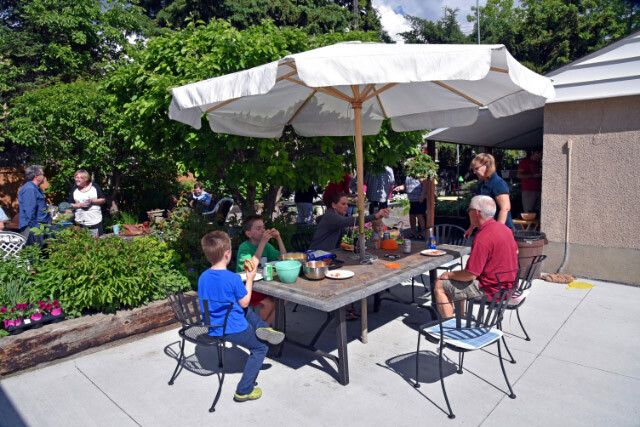 The Social Master Plan for St. Albert highlights and promotes the city as a welcoming and inclusive community. The new education campaign to raise awareness, entitled "It Starts With Me" was launched with the goal of helping citizens better understand groups at risk of exclusion in the community. Thank you for your thought-provoking presentation, Leanne. 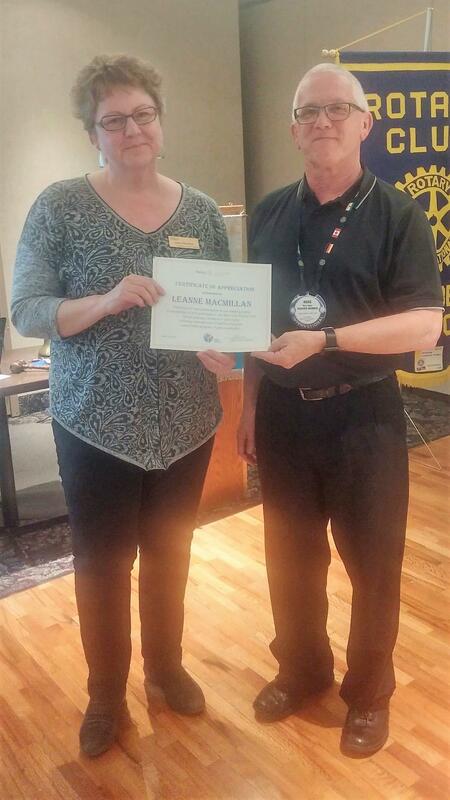 Shown in the photo with Leanne is Saint City Rotary past president, Ross Algar. 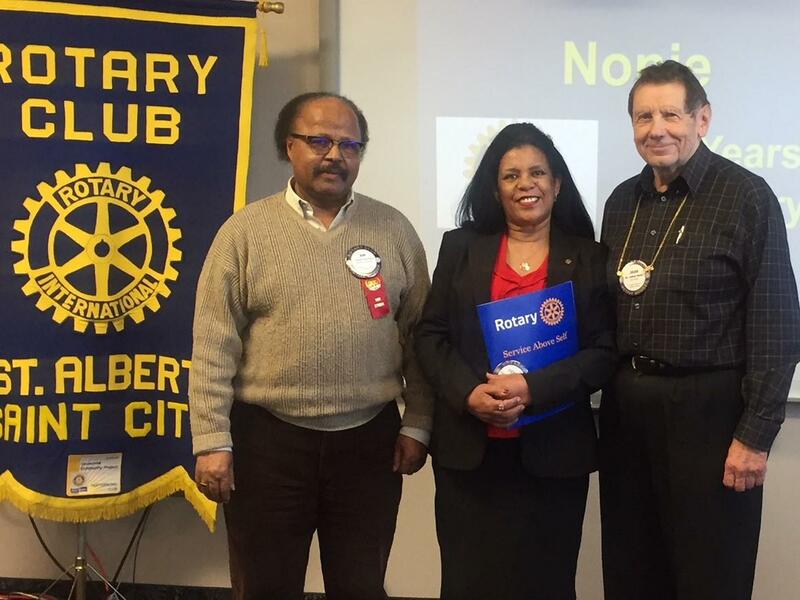 Each month Saint City Rotary Club honours one of its members for outstanding service to the club. 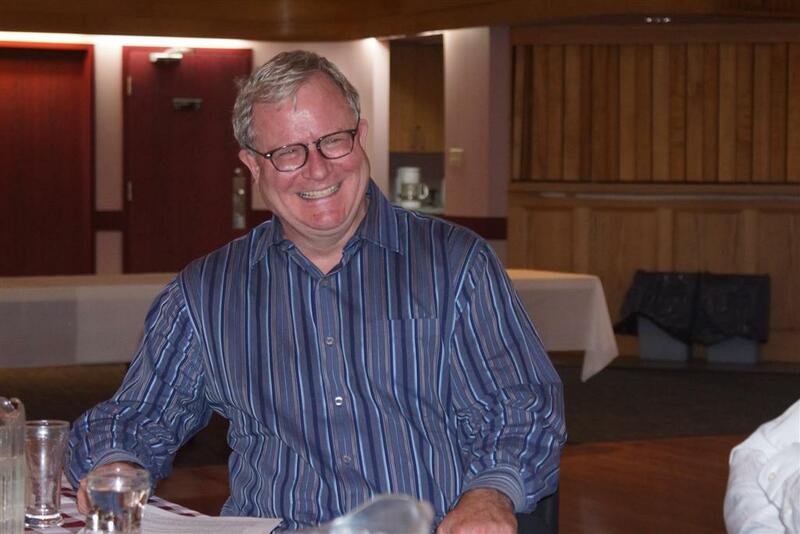 This month, we were pleased to acknowledge the contributions and excellent service of Nick Algar. Nick chairs our International Services Committee and helps out in many other ways. Thanks for all you do, Nick. 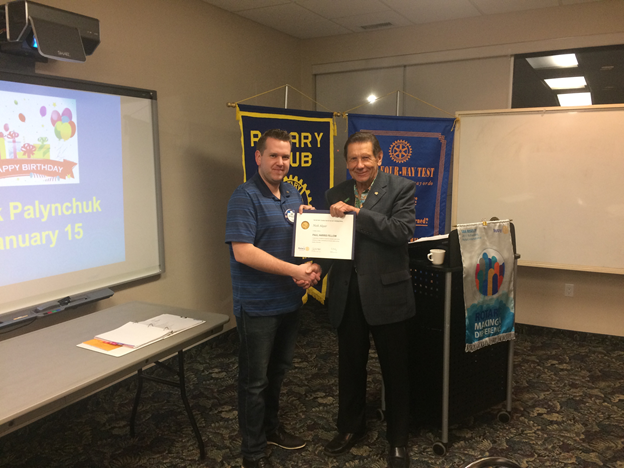 Club president Julius Buski is shown presenting Nick with his certificate of appreciation. 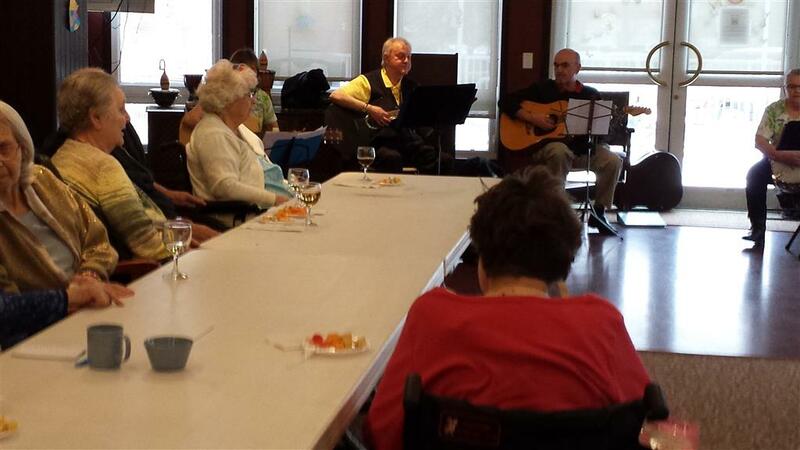 Our program this week (March 27) featured Laura Young from the Parkinson Association of Alberta. Laura presented a comprehensive and very interesting overview of the disease, current treatment options, and the good work being done by the Parkinson Association. Thank you for visiting us, Laura! 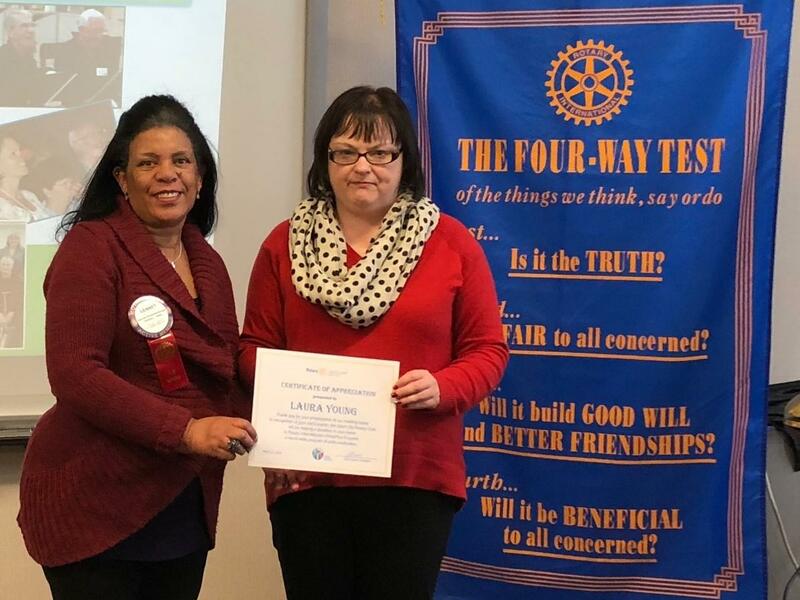 Shown thanking Laura is our newest member, Gennet Ghebremichael. Come check us out. Graphics courtesy of Debbie Vance. St. Vincent de Paul Society St. Albert Conference president Ken Gallagher spoke to Saint City Rotary at our meeting on March 13 and told us about the Society's work and their great need for a truck. Along with Ken we heard from Conference members Bernie McCracken and Val Merchant. Thank you for all you do for the community, St. Vincent de Paul Society! 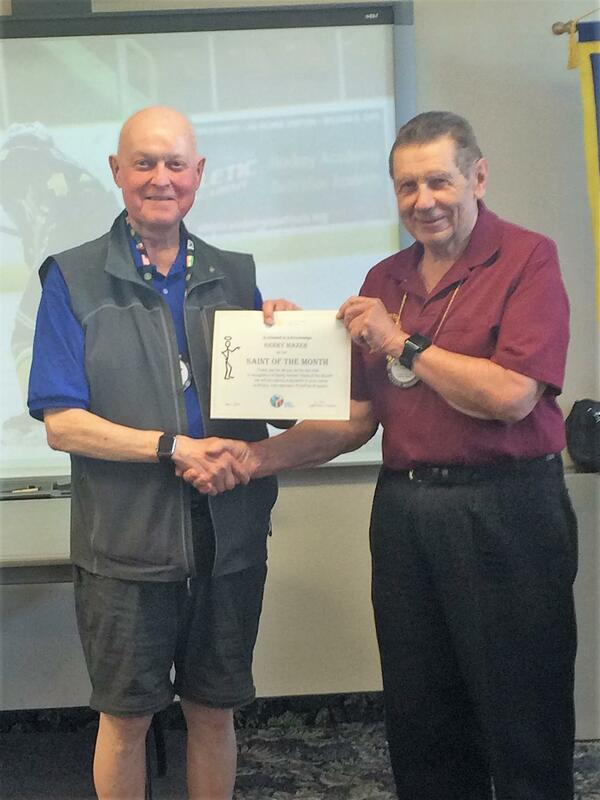 Shown presenting a certificate of appreciation to Ken is Club Administration Co-Director Jeff Hodgson. 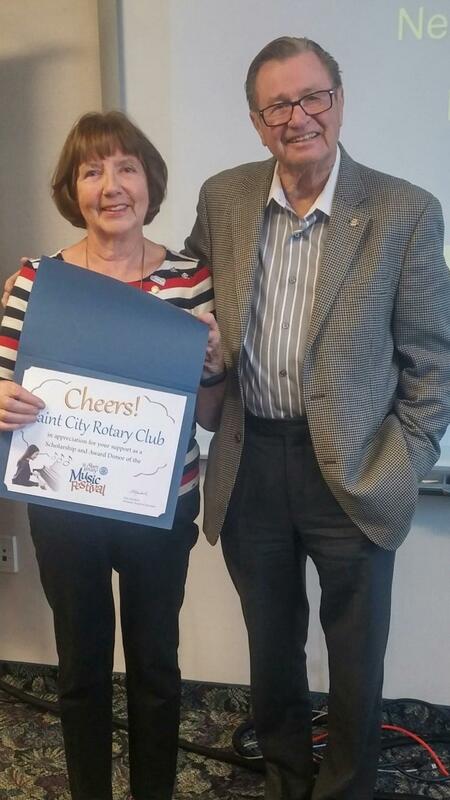 Gennet was inducted into Saint City Rotary at our meeting this evening (March 13). Shown with Gennet are her husband Ash, also a member, and club president Julius Buski. 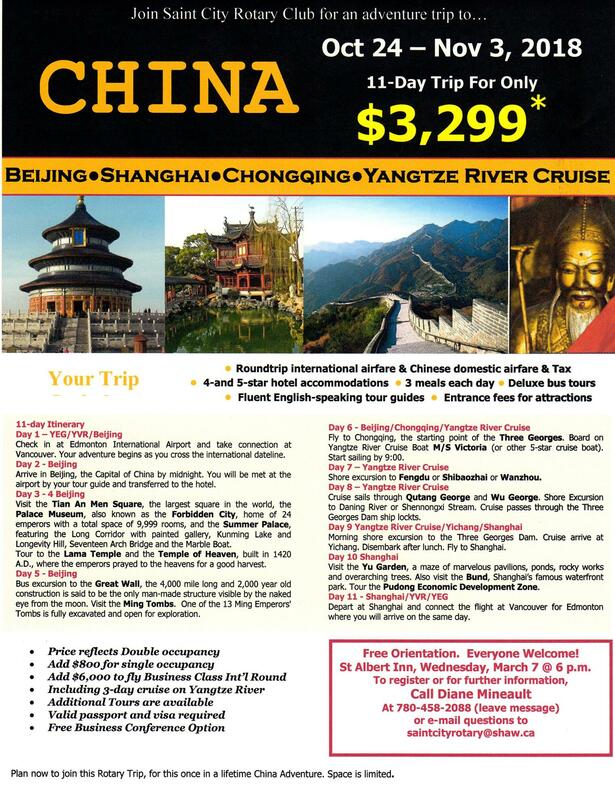 We are now accepting registrations for our China trips in October. 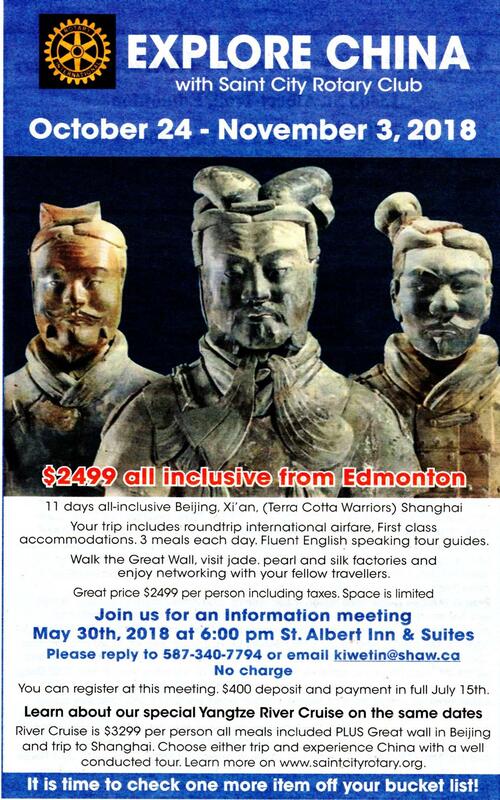 Please click on the China Trip link above. 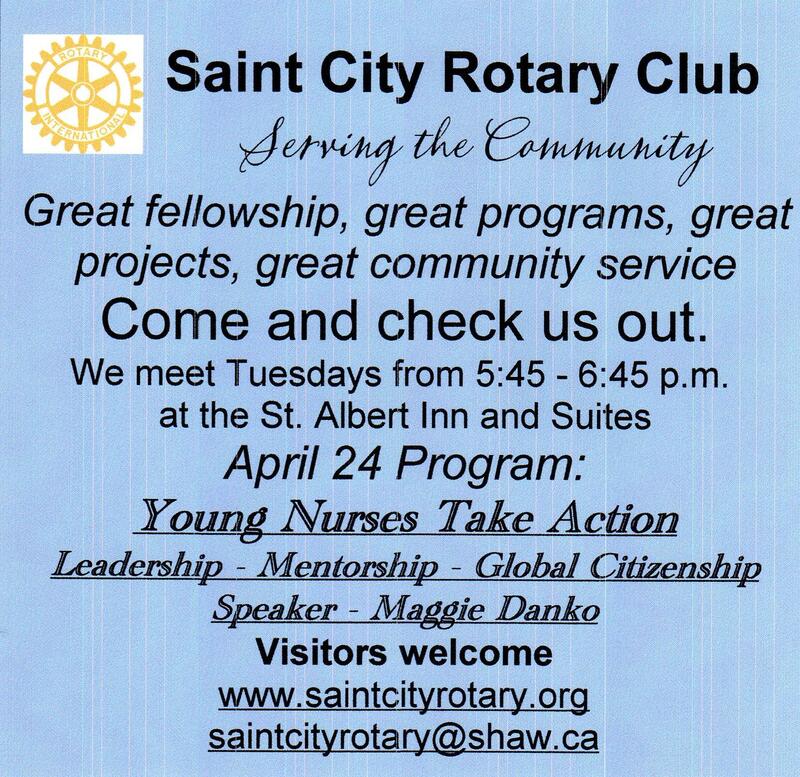 Also - plan to attend our free orientation evening on Wednesday, March 7, 6:00 p.m. at the St. Albert Inn and Suites. 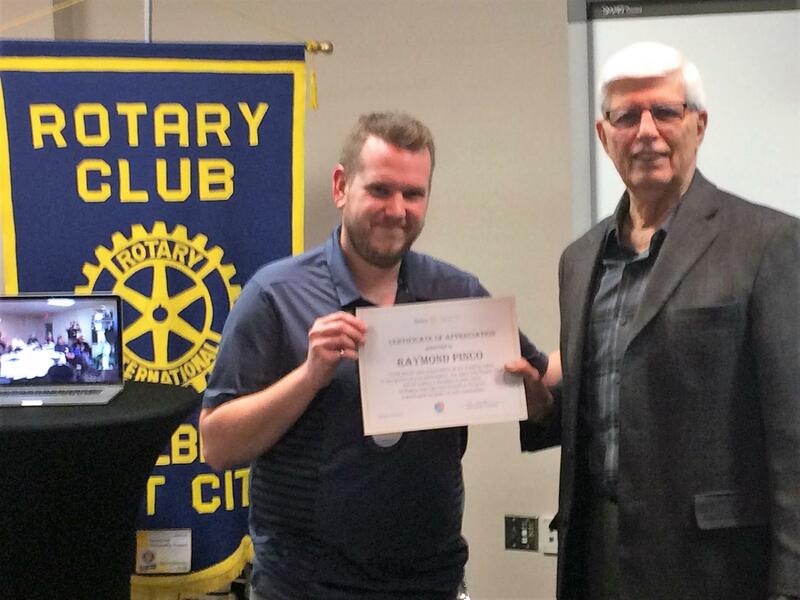 Saint City Rotary is pleased to acknowledge Mark Palynchuk as our Saint of the Month for January. 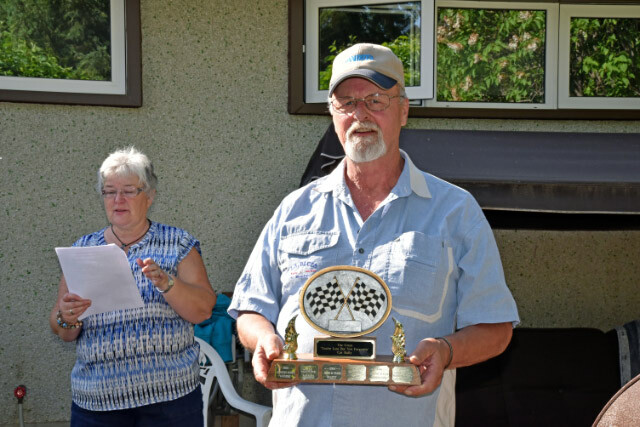 Mark, who serves as our Sergeant-at-Arms and helps out in many different ways is always there when needed, provides humour at our meetings and is never afraid to ask the tough questions. 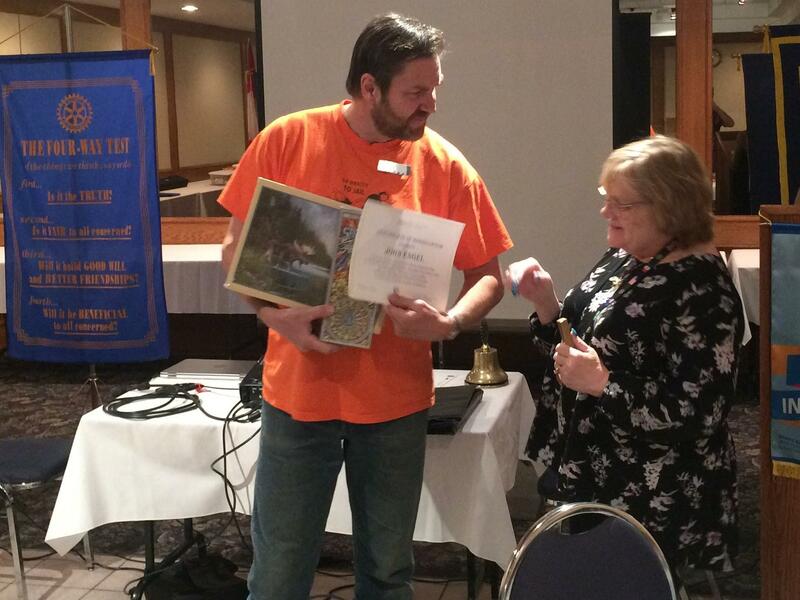 Congratulations, Mark, and thank you for being a Saint City Rotarian. 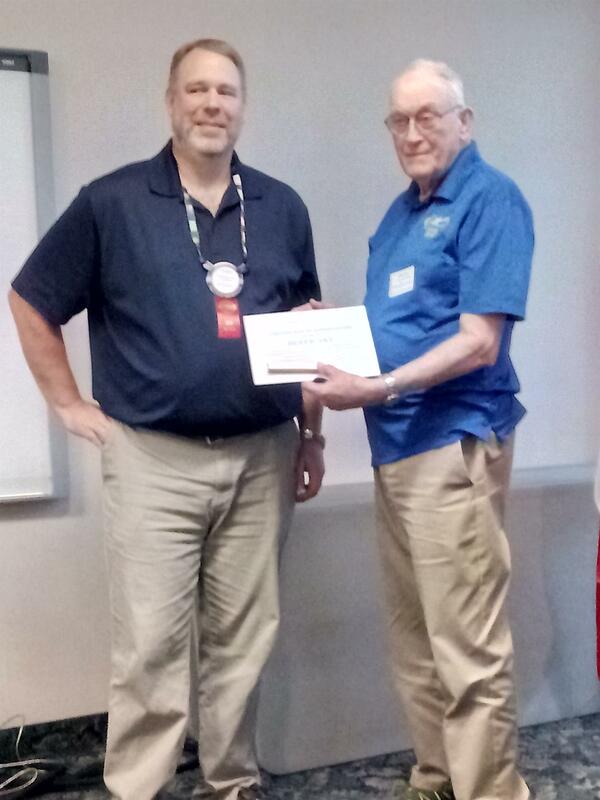 Mark (on the left) is shown receiving his Certificate of Appreciation from club president Julius Buski. St. Albert is open.........open for business......open for change. 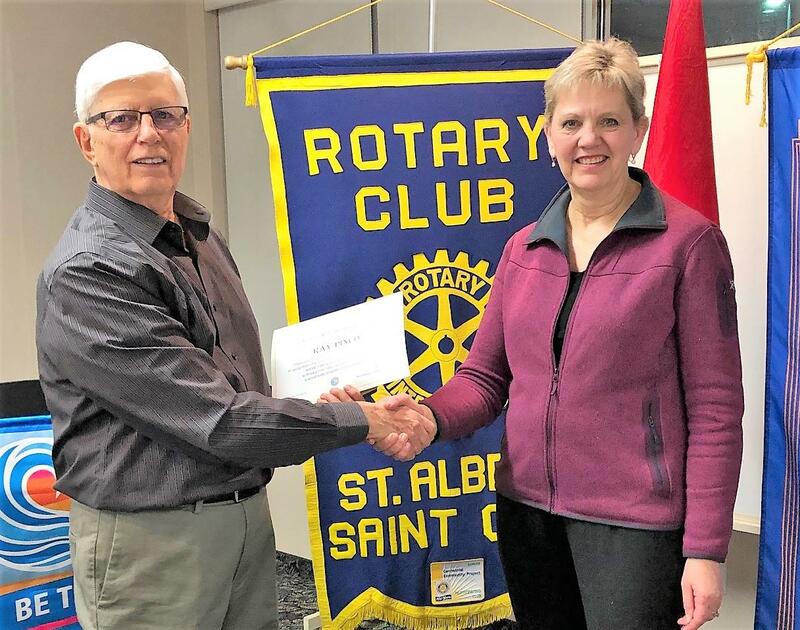 That was the message St. Albert Mayor brought to Saint City Rotary in her informative presentation to the club this evening (February 6). In addition to sharing her insights with the club, the mayor fielded a number of questions from club members. Another great meeting! 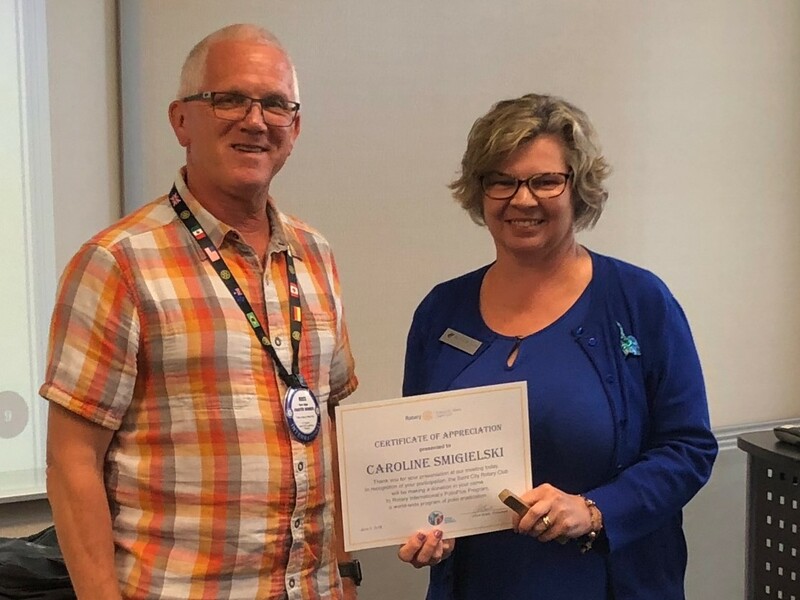 Shown in thephoto is president-elect Nonie Buski, presenting Mayor Heron with our club's certificate of appreciation and a donation on her behalf to PolioPlus. 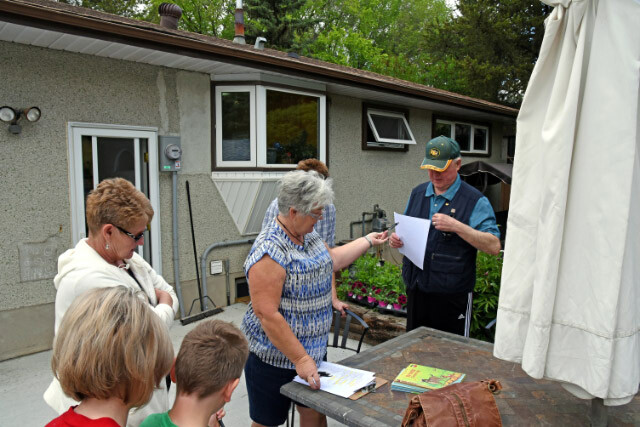 Who benefits from the St. Albert Food Bank? Where is the greatest need? How is the food bank supported? Is there a homeless problem in St. Albert? 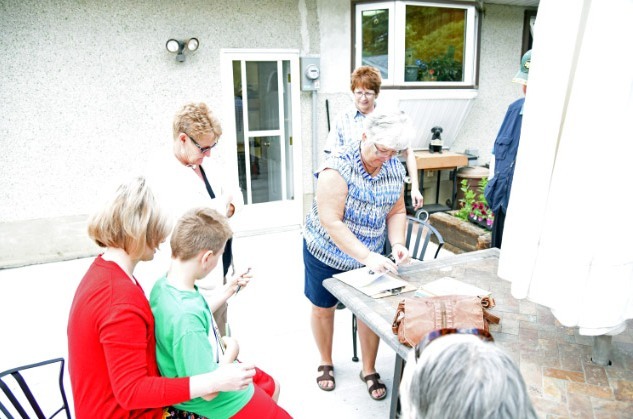 How does St. Albert Community Village serve the homeless? These are just a few of the questions our guest speaker this evening, Suzan Krecsy, answered for us in her informative presentation. 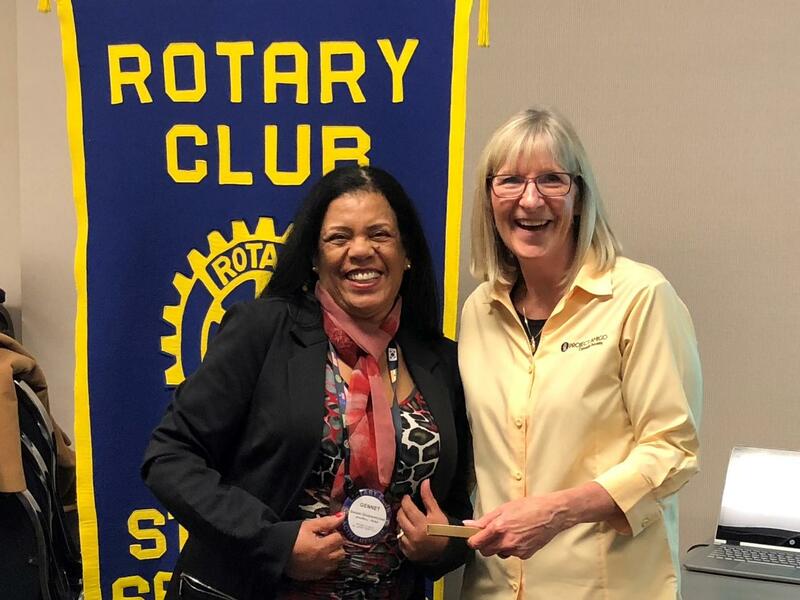 Thanks for coming and sharing your expertise with Saint City Rotary, Suzan! 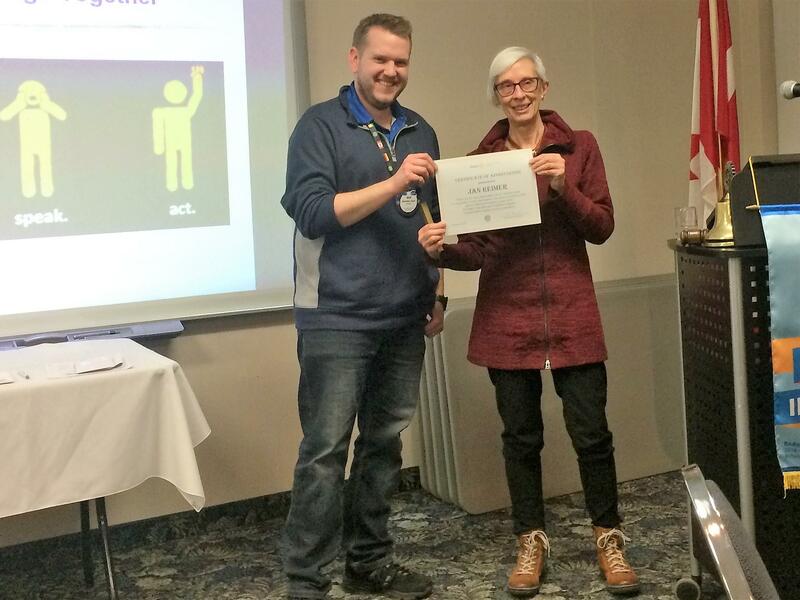 Shown in the photo is Ross Algar, a past president, presenting Suzan with a certificate of appreciation. 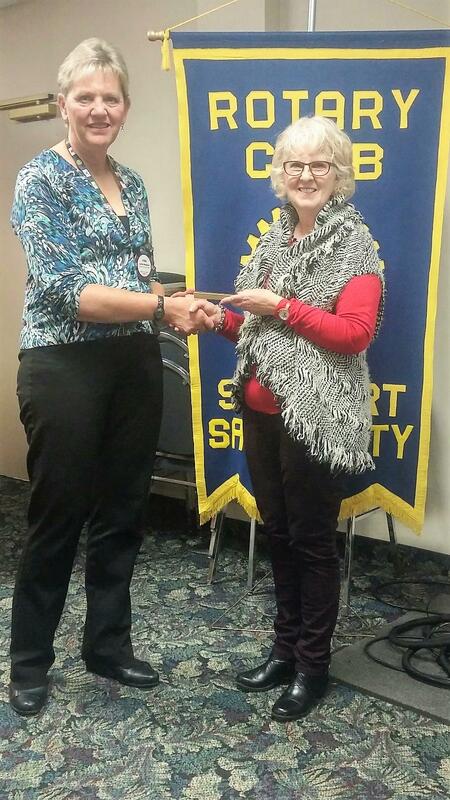 Estela Oates, Rotary's newest member, was welcomed into the Saint City Rotary Club at our meeting on January 23. Estela's classification is Commercial Cleaning. She and her husband operate Elysha's Cleaning and Restoration. 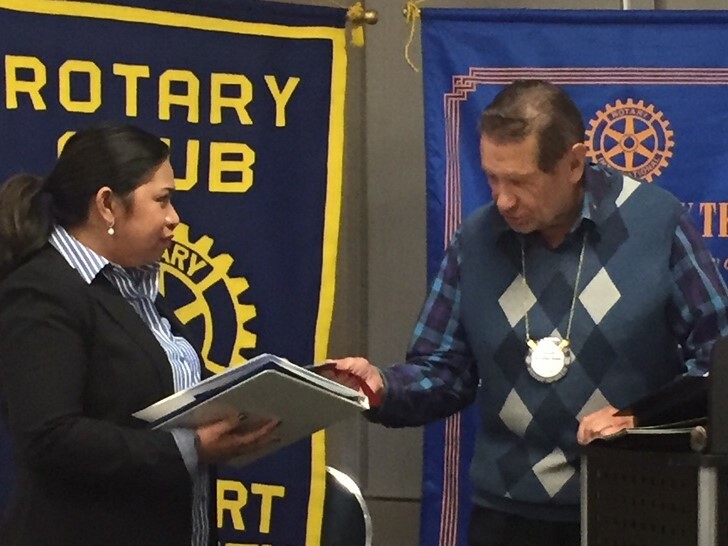 Welcome to the Rotary family, Estela. Shown in the photo is Estela receiving her new member kit from club president Julius Buski. 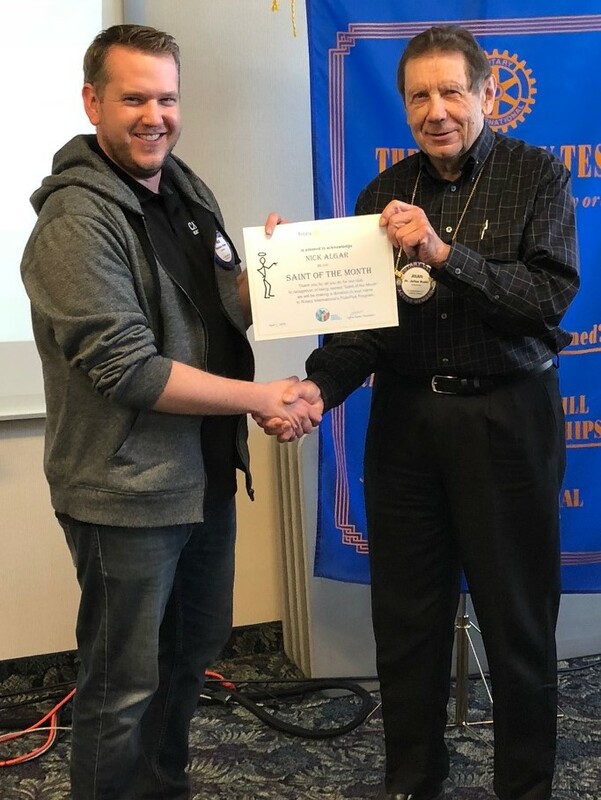 Congratulations to Nick Algar, who received his Paul Harris Fellowship at today's (Jan 16) meeting of the Saint City Rotary Club. 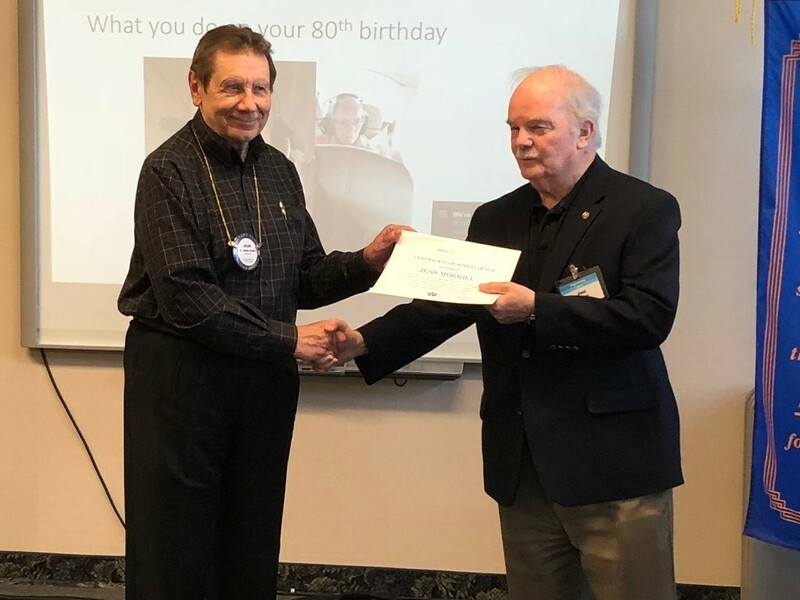 A Paul Harris Fellowship is named in honor of Paul Harris, Rotary's founder, and is awarded to an individual who contributes an amount of $1,000 US to the Rotary Foundation - one of the top foundations in the world Thank you Nick. 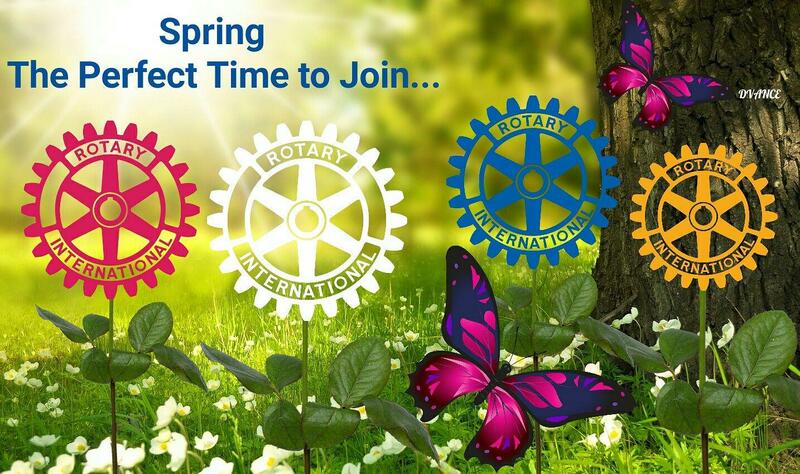 Your contribution assists the Rotary Foundation to continue doing good in the world! What a wonderful day for a car rally. 4 teams set out - 2 were at a disadvantage as they were not members of our club but are friends of our club. Their route was handed out and the race began. They had to record their mileage to ensure their were not cheaters. Their route took them to the homes of all our members but there was questions they had to answer about each place. 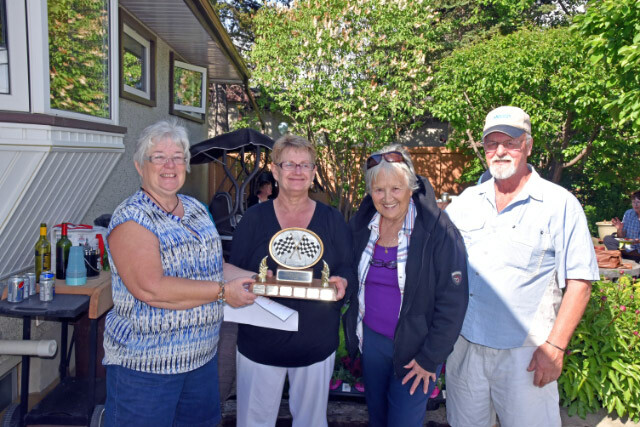 They returned with answers and the winners were Bonnie, Larry and Pauline. 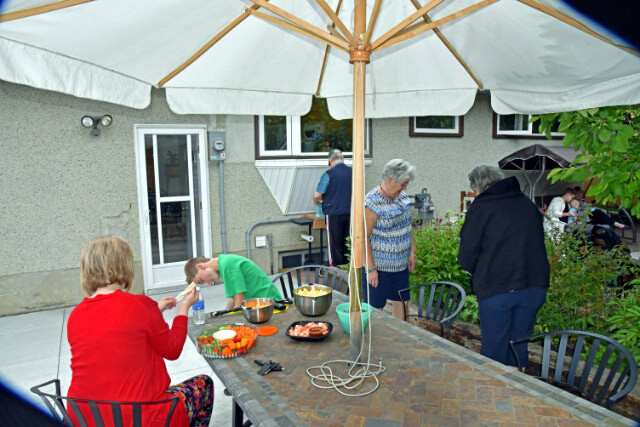 BBQ followed with great conversations, fun, laughter and of course lots of food. My 3 grandchildren, Terri's step son, and Ross and Lynn's Grandson also attended. Rotary is about getting to know not only each other but our families and friends. 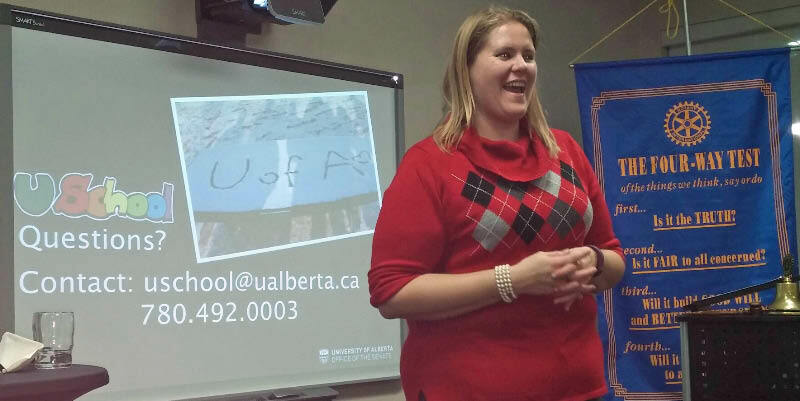 Our speaker today was Amissa Jablonski from the University of Alberta Senate Office, who told us about the Senate's fantastic USchool Program. Guest Speaker, Patty Milligan gave an amazing talk about Bees, covering a vast area of information. Who knew there were 20,000 varieties in the world? Patty's presentation had to be ended to to time constraints, so she was immediately booked for a part two presentation in October. You won't want to miss it. 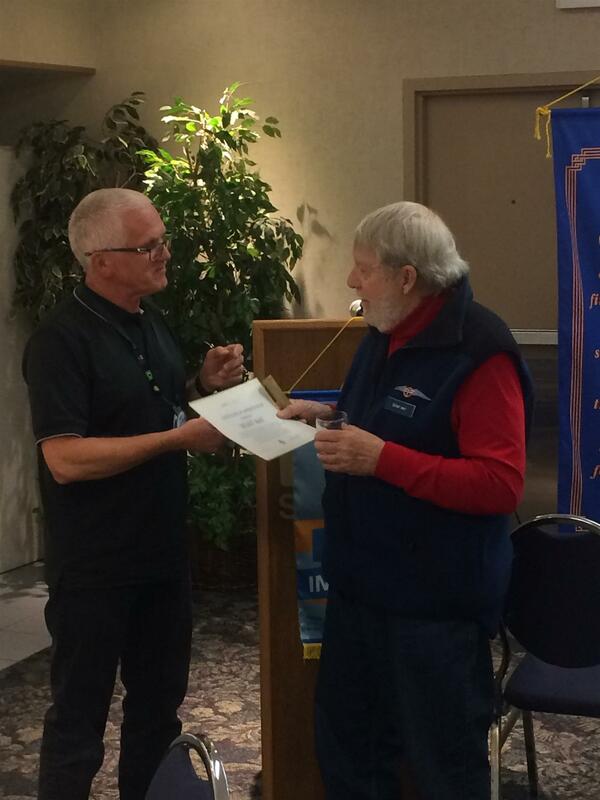 Ross Hallet, member of the e-club in Edmonton , presents a banner to Ross Algar, President. 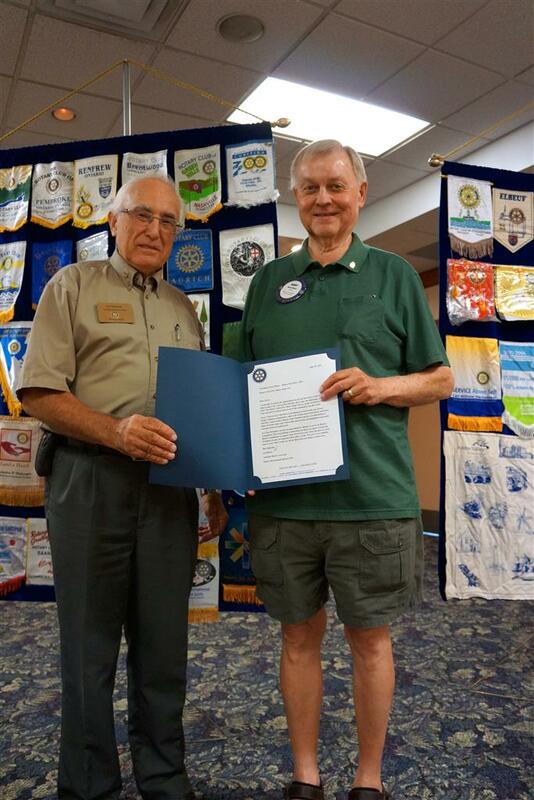 Assistant District Gevernor, Syl Haisan, Presents Past President Gerry Mazer with a letter of commendation for the club's progress over the past year. Our annual Road Kill BBQ is held immediately after our members have cleaned up a section of highway in the St. Albert area. Mystery meat burgers are always a favorite item! You don't need a Facebook account to view facebook pages. But you do need one to post and participate. Since Saint City Rotary now has a Facebook page, here is how you can easily join Facebook. Listed below are some of the projects, activities and speakers the club had throughout the year. We try and ensure that there is a good mix of great speakers, volunteer effort, fellowship and business networking by all members. 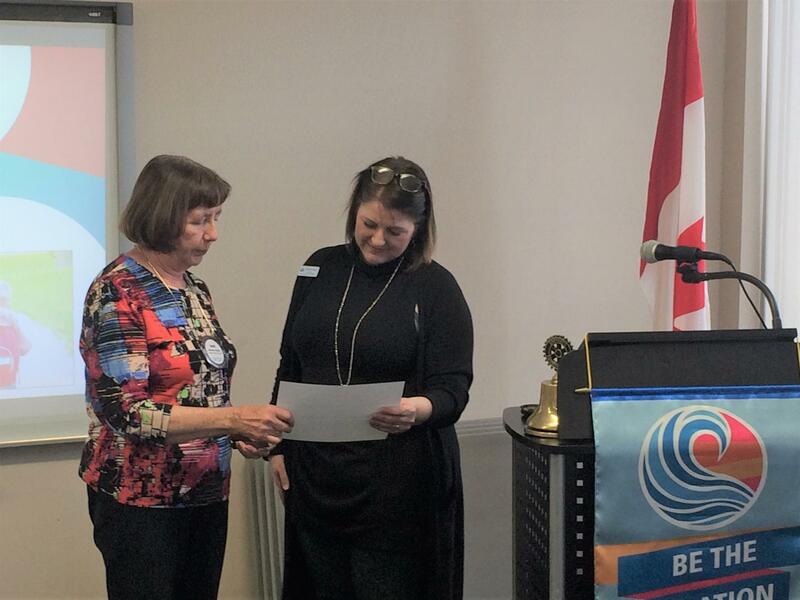 Guest Speaker, Rachael Putt, from the Bissell Centre in Edmonton gave a great overview of the Centre and the work they do for thousands of homeless people in Edmonton and area. Their primary goal is to get homes for these people. Then they work on food, clothing and jobs. It is a tremendous job requiring a lot of support and many volunteers. Their web page which has much more information is www.bissellcentre.org. Guest Speaker, Gem Munro, talked about the Amarok Society, where he is the Director. This society works in severely poor countries where education for females is almost non-existent. There education model is totally different from the norm. They believe that if you teach a mother, you teach a family. If you teach five mothers you teach a neighborhood. With this believe, they provide free education to a group of mothers who then are required to teach their own childrenin their own home and some of their neigbours children. This has turned out to be very successful and has spread rapidly. More information is available on their web site at, www.amaroksociety.org. 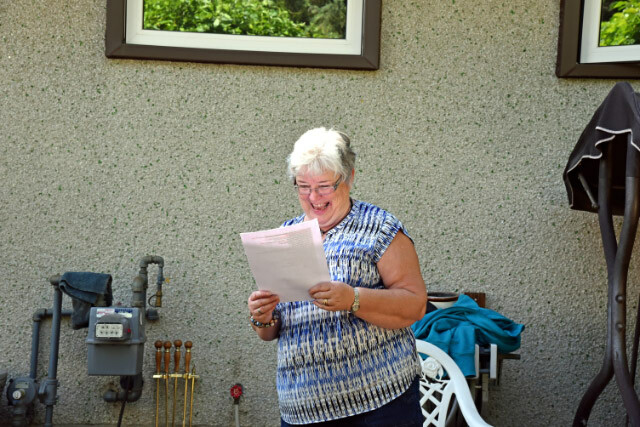 Guest Speaker, Yvonne Bull is a long time resident of St. Albert. 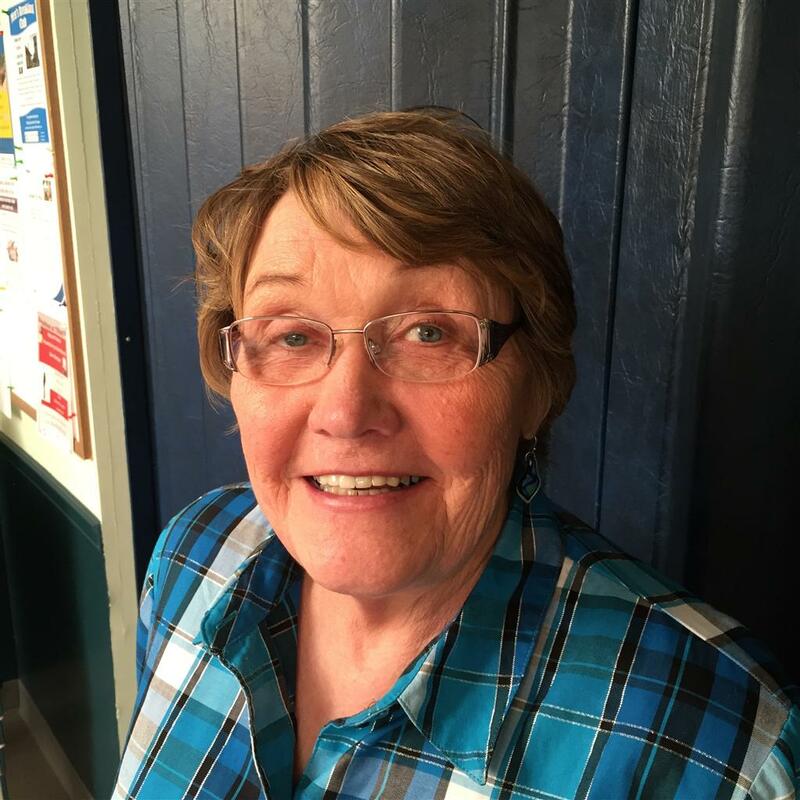 She was a very active member of the St. Albert Rotary club for many years. Now she's concentrating on volunteer work for the Fifty Plus Club. He current project is the writing and production of a high quality book with many pictures and stories about the history of the Fifty Plus Club which will be going through a major renovation and expansion starting this Summer. When complete, copies of the book will be given to the City and to the library, and will be available for purchase by anyone in the community. Yvonne shared the project with our club and asked us to consider a donation so the cost of the book for the over 500 members could be reduced. 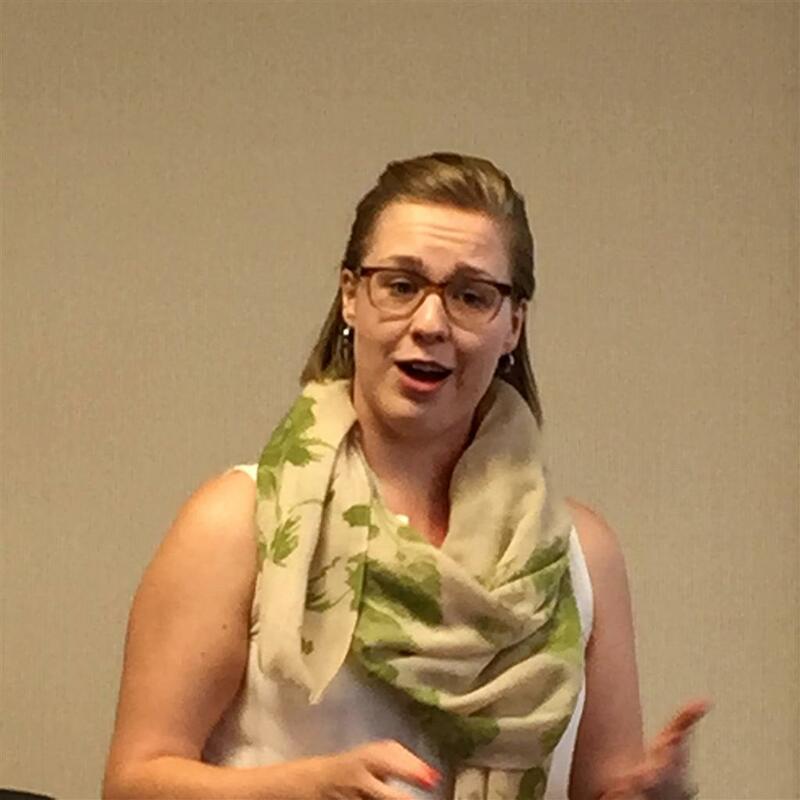 Tuesday's guest speaker was Kristy Russ, BscPharm, APA. She talked about transforming your health, and how to stop letting health problems interfere with the life you want. Kristy is a practicing Pharmacist who runs a one on one health consultation business as well. She says getting older does not mean having to slow down. You just need to learn the right things to do. 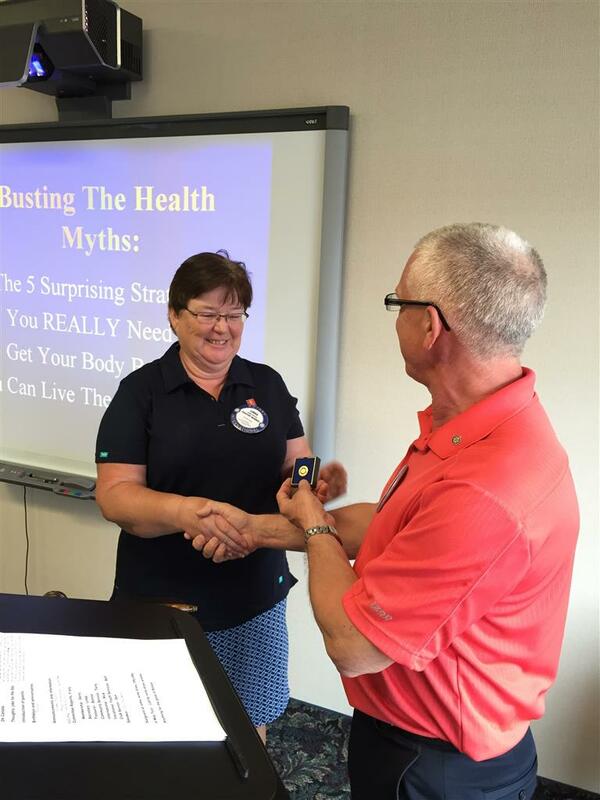 Kristy offers a complimentary health consultation ( $150.00 value) for all Rotarians. This can be booked at http://www.timetrade.com/book/KK7D2. She challenges all of us to get our life back! Linda Perras has achieved her Paul Harris times two! Congratulations! 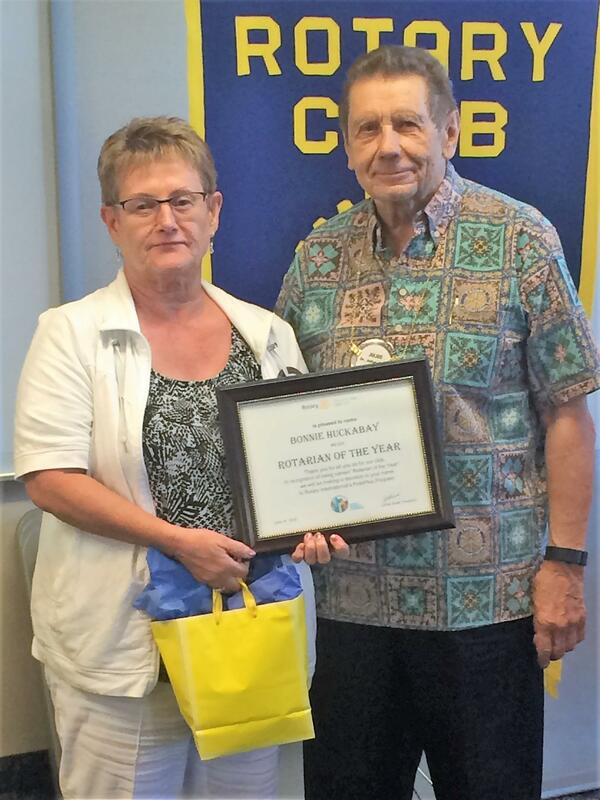 President Ross Algar presents Linda with her prestigeous award. Paul Harris awards are achieved when $1000.00 US is donated to the Foundation for its many worthy programs around the world. Linda now has three! 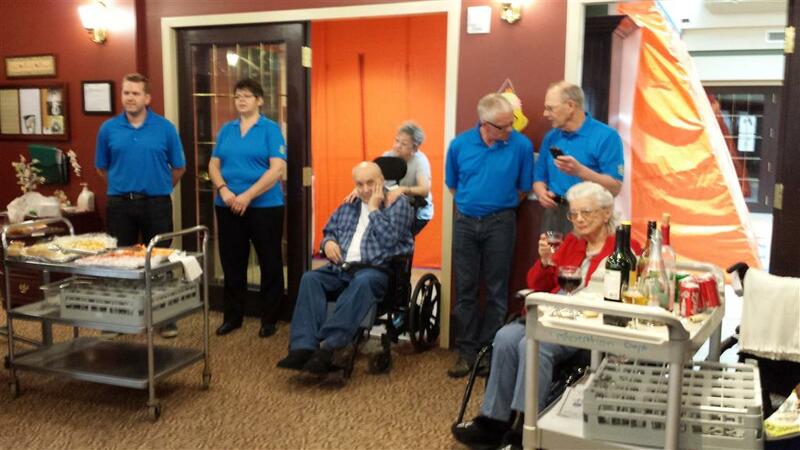 Members of Saint City Rotary assisted with a wine and cheese party held for the residents of Citadel Muse. 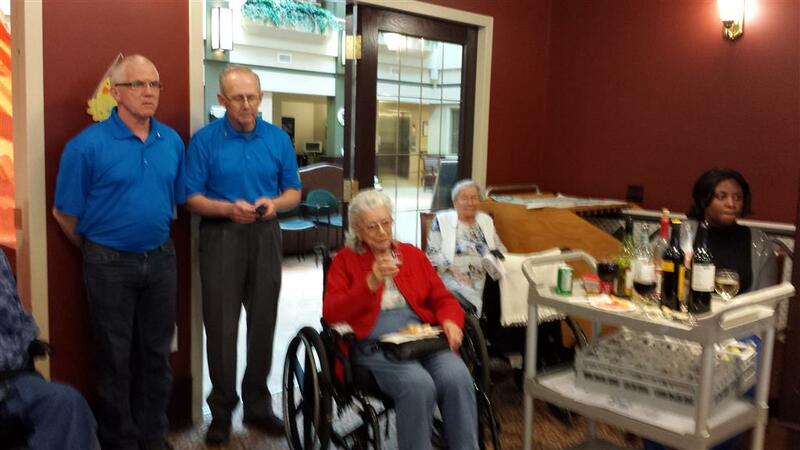 Rotarians helped serve the residents and help them to and from their rooms. Most of the residents were wheelchair bound. While this was going on, one of the Rotarians and his band played and sang songs. A good time was had by all. 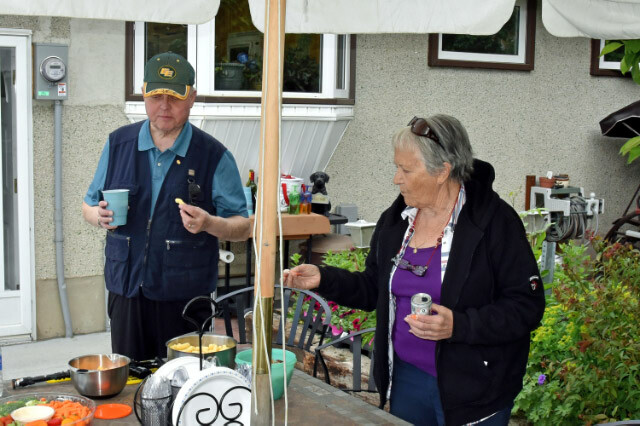 A special thanks to Councellor Tim Osbourne who assisted the band and helped the Rotarians serve the residents. 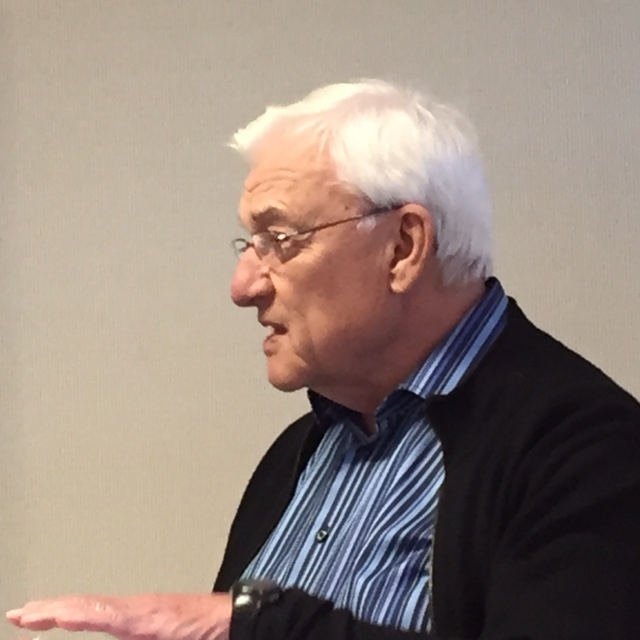 President Guy Smith of the AUPE addressed the Saint City Rotary Club on March 24th, giving an excellent overview of the work and challenges of the public union. As President, Guy has an extremely complex job managing and dealing with union issues for thousands of members. Adam McKay, Branch Manager of Servus Credit Union in St. Albert presents a cheque to Saint City Rotary in support of the golf tournament. Guest speaker, Larry Wilkins, talked about a special private school next to what was formerly known as the Hobema Reservation. He says the high school on the reservation, which is funded be the federal government, does not work. It is riddled with gangs and many of the kids choose not to attend it. His organization has built a special private school next to the reservation, with strict rules against gangs and drugs. He is raising over $4 million for a new state of the art school. Students have to be accepted into the school and can be dismissed for breaking the rules. 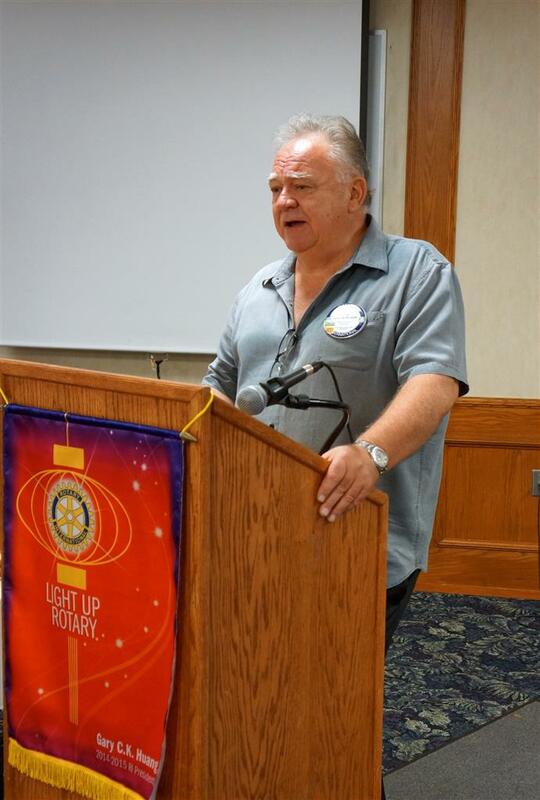 Mr. Wilkins is asking the Rotary clubs to help him raise the remaining funds needed. He already has over $2 million. 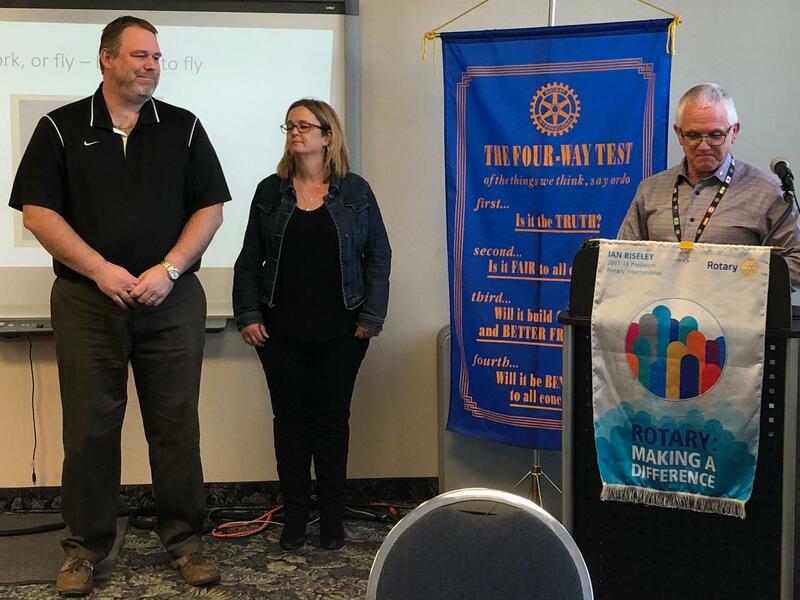 Guest speaker, Curtis Crouse, at the March 3rd Rotary meeting, gave a well thought out overview about the difficulties experienced by all kinds of organizations looking to increase their memberships. He didn't have all the answers on what to do about it, but he mused on various ideas the club could try. remand Centre and the role played be the Chaplain. The number of inmates that pass through this institution numbers in the thousands per year. 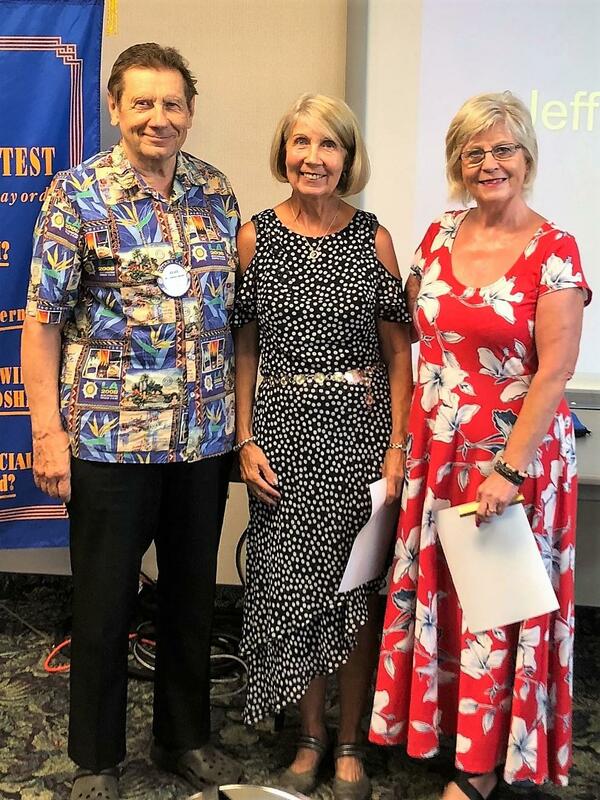 Guest speaker, Derek Jay from the Mayfield Rotary club talked about the Mercy Ship project that serves poor people in third world countries. The ship, staffed by Doctors, nurses and many others, volunteer their time to provide life altering surgeries to thousands of people who can not afford anything. Currently, they are working on the East coast of Africa. The Saint City Rotary Club has decided to support this worthwhile project financially. 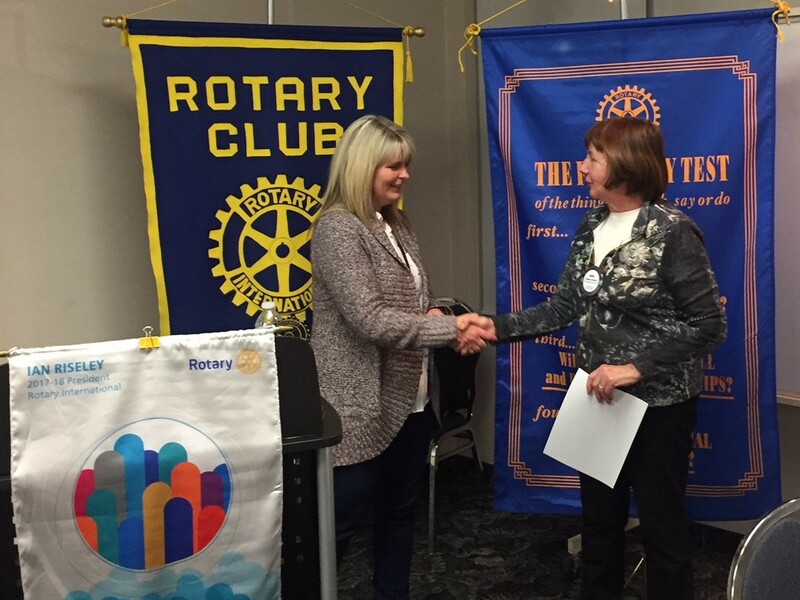 District Governor, Linda Robertson Visited with the Board and was the speaker at a Rotary Meeting. Rotarian Warren Renner has become the Movember man, thanks to his staff at work. Cam Rennie attended the meeting a played a great rendition of Taps. It was very much appreciated. 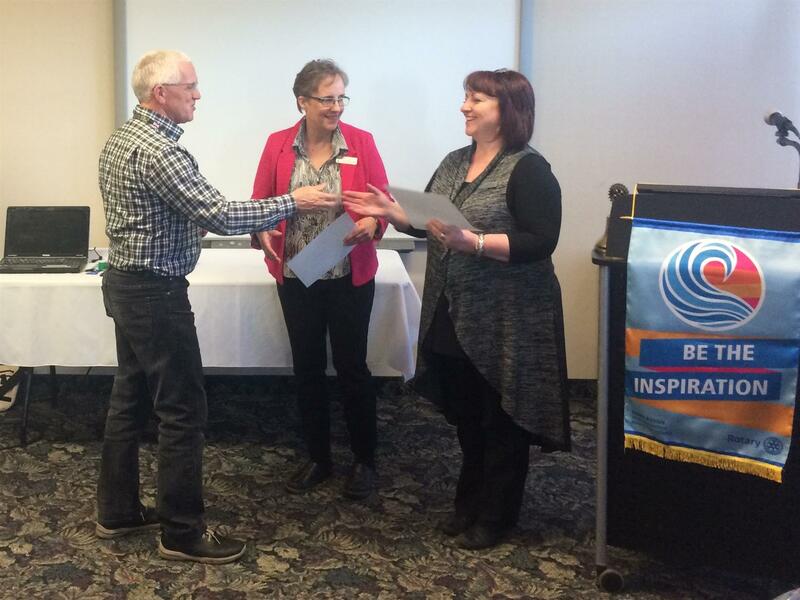 Danielle Reed, a member of the Morinville Rotary Club is a Life Coach. who owns and operates a business called, Coach on the Go. She presented our club with an overview of her work, mostly with girls, but she is available for adults and males as well.. Her web page is: http://coachonthego.net/. Chamber of Commerce speaks at Rotary during Small business week. 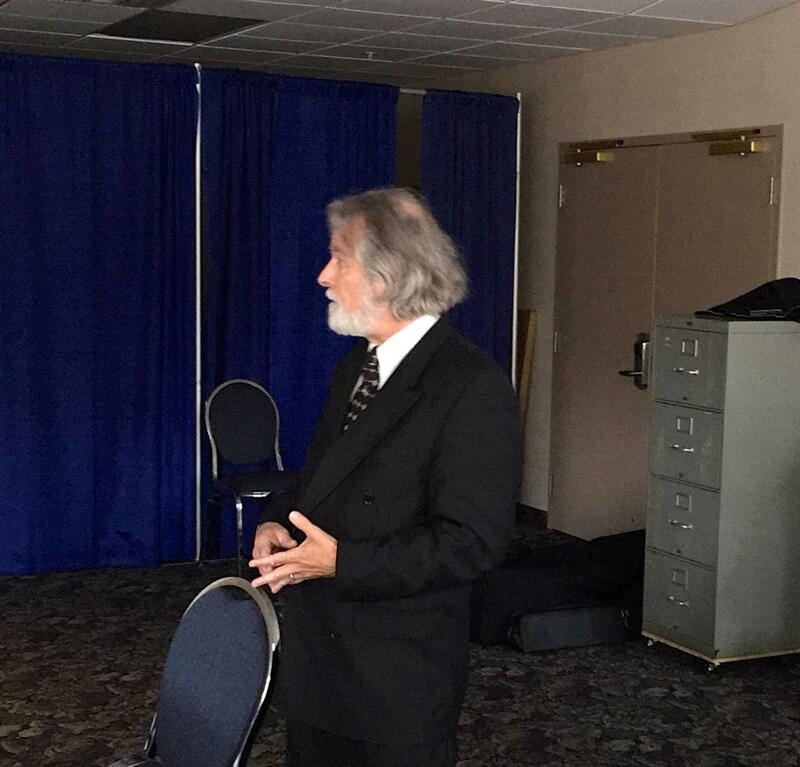 Paul Quantz, Chair of the Chamber of Commerce was the guest speaker during small business week. He was introduced by Lynda Moffat, the CEO and President of the Chamber. Lynda will soon be the President of the Canadian Chamber of Commerce, which is good news for Alberta and St. Albert. 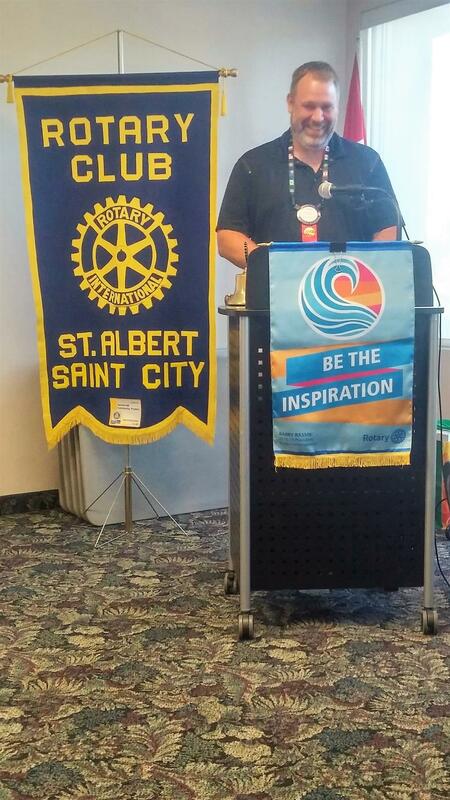 Paul, a former member so Saint City Rotary, gave an excellent overview of the work of the Chamber of Commerce. Maureen Henkel, Development Officer for Stars Air Ambulance gave a presentation about Stars. Since they started operations in 1985, they have flown over 26000 missions. Finally, After ten years of fundraising, planning and a variety of setbacks our Rotary Park is now officiall open. Kristin Ward from the Alberta government led a workshop about Rotary. She was able to get all members and guests to participate in a very worthwhile discussion. Guest speaker, Councillor Sheena Hughes, gave a very interesting talk on her views of the plans for downtown redevelopment. Kathy Sandmarier, along with two Morinville Interact students, talked about their trip to Mexico to help with the People of Hope project. The students showed an excellent video of their experiences, which they said was life changing. Saint City Rotary members filling packages with all kinds of goodies for the golfers who will be playing in the golf tournament on Thursday. Breakfast at Seven, shotgun start at eight, and BBQ with prizes at about Two. Hopefully there will be no rain. 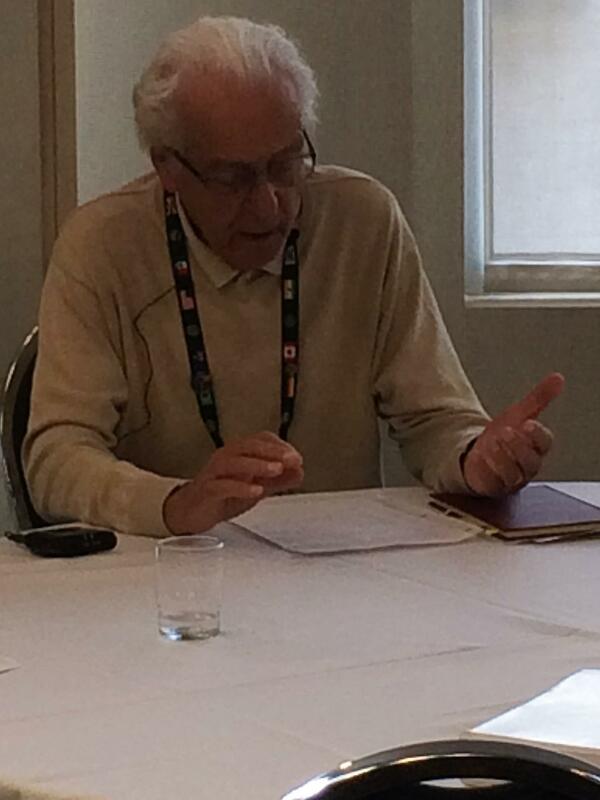 Don Vaugeois gave a great talk about his life, work and family. Once he got into the piano business, he never looked back. Don's Piano has become a major force in the industry over the years. Many of his staff have stayed with him for many years. He believes this is partly due to his treating staff like part of the family. 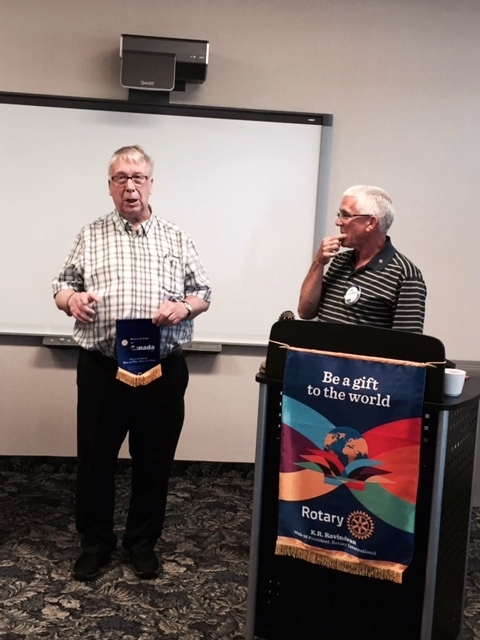 Guest Speaker, Raymond Merhej, from the Strathcona Rotary club speaks about Project Wheelchair, and seeks our support. President Ross conducts his first meeting as President for the 2014-2016 Rotary years. 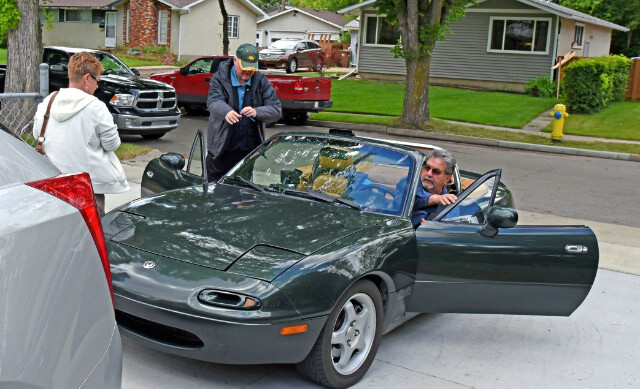 Each year we have a car rally that many members take part in and enjoy. Always a challenge, and always good companionship afterwards. Be careful! Our course master can be tricky! A regular feature is to have occasional site visits to one of our members place of business. This allows our member to highlight his business, and gives us a better understanding of what exactly he or she is involved with. We regularly have quality and high profile guest speakers on various topics, including the Premier of our province. Many of our members look forward to our "Guess who's coming for dinner" event. 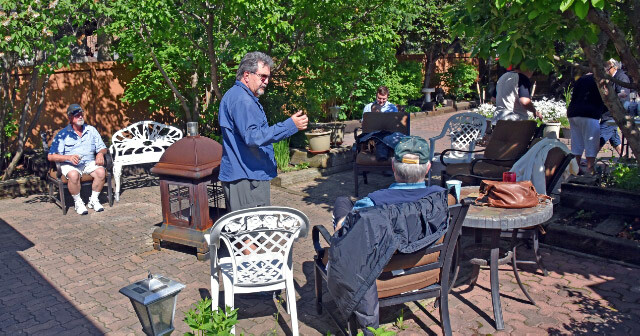 The premise is that a number of our members host a dinner, and the rest of the membership is advised by the organizer 1 hour prior where to show up. Of course, all members are required to assist in one of the courses (salad, dessert, etc), with the host supplying the main course. A Saint City Rotary work party packed 30 hockey bags with used fire fighting equipment.Â The equipment has been ruled obsolete for fire fighters here in Alberta but is still very useful to a fire brigade that doesn't have any equipment at all. Every Christmas season, the Saint City Rotary club provides transportation and snacks for up to 50 seniors to view Candy Cane Land and Bright Lights at Hawreluk Park.